Lynndy and I were in Auckland, New Zealand recently for the wedding of her niece. We stayed with her brother and his wife. They have a wonderful home with some nice examples of arts and crafts furniture, one of which was an apothecary chest. I really love these pieces, and Lynndy especially has wanted one forever. 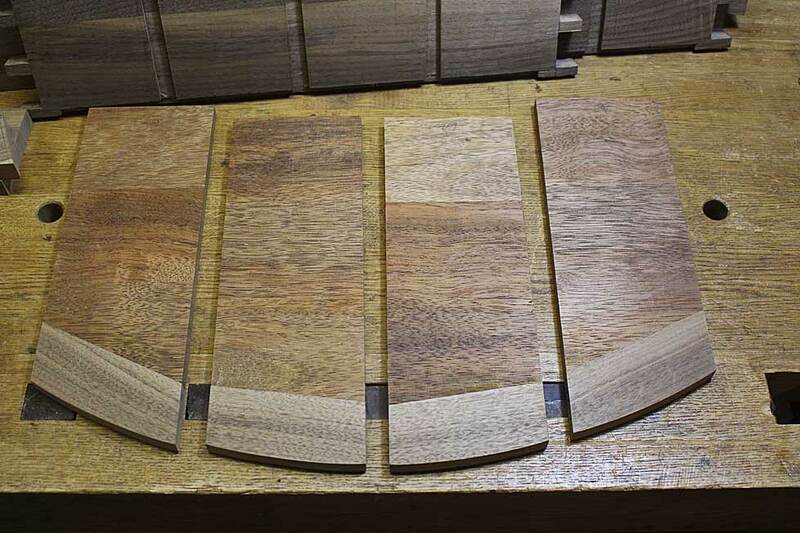 So the order was placed and a spot lined up in the entrance hall. 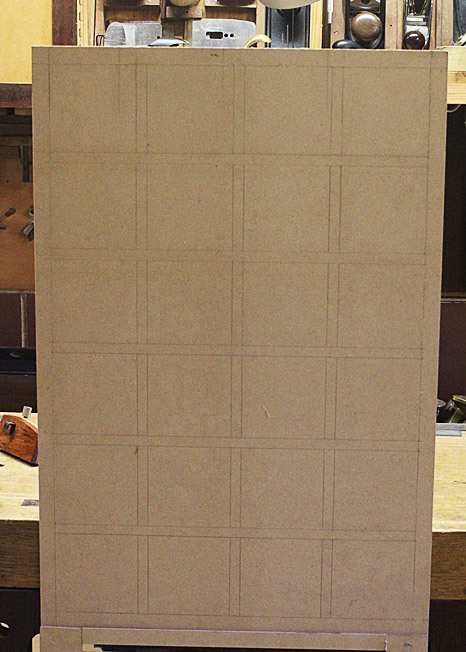 The design was mostly worked out in idle musing, and then I drew it up on sheets of 6mm MDF (I like this since the sheets end up as a story board and may be stored away more easily if needed at a later date). 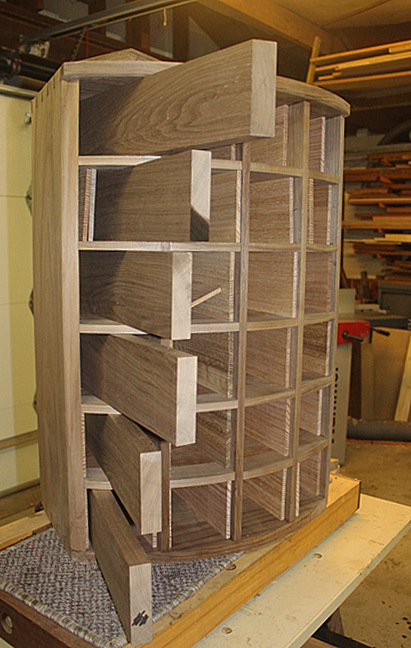 The orientation is vertical, rather than typically horizontal, more along the lines of a Krenov-styled cabinet. 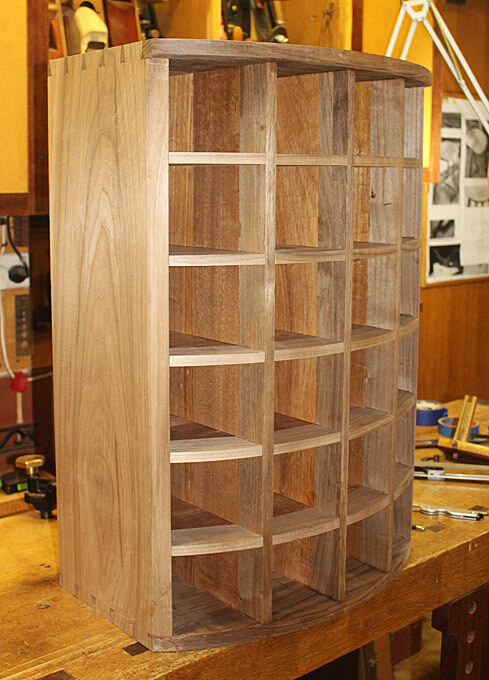 I’ve never built a Krenov-styled cabinet and, as far as I am aware, he never built an apothecary chest! In other words, this is a chest on a stand. As an aside, I am not enamoured with the spindly legs of Krenov designs, and something with substance is needed. More on this at a later date. 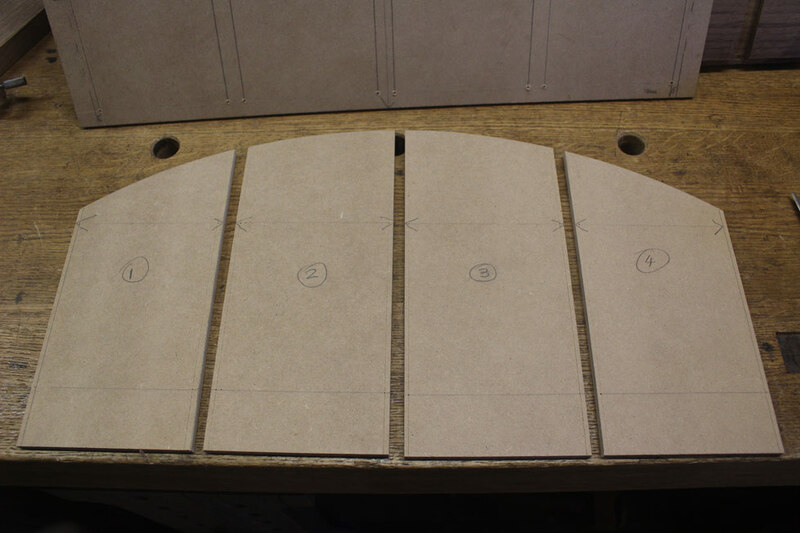 What has changed in the drawing above is the rows will be made to accentuate the vertical rather than the horizontal (by running the blades/dividers down first). This is more work, but is should create a different perspective. 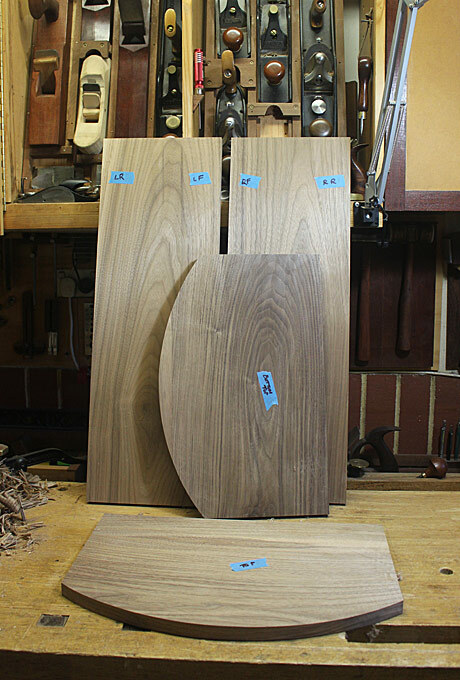 The wood is another first for me – black walnut from the USA. 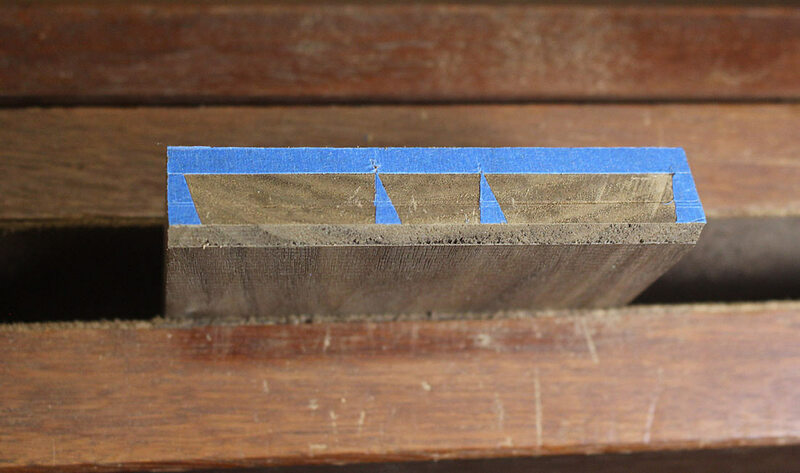 My local timber guy had a stack of 1” and 2” thick boards, all about 11-12” wide. (For those who see metric measurements on the plans and here is mentioned imperial sizing, be aware that this is my common practice. 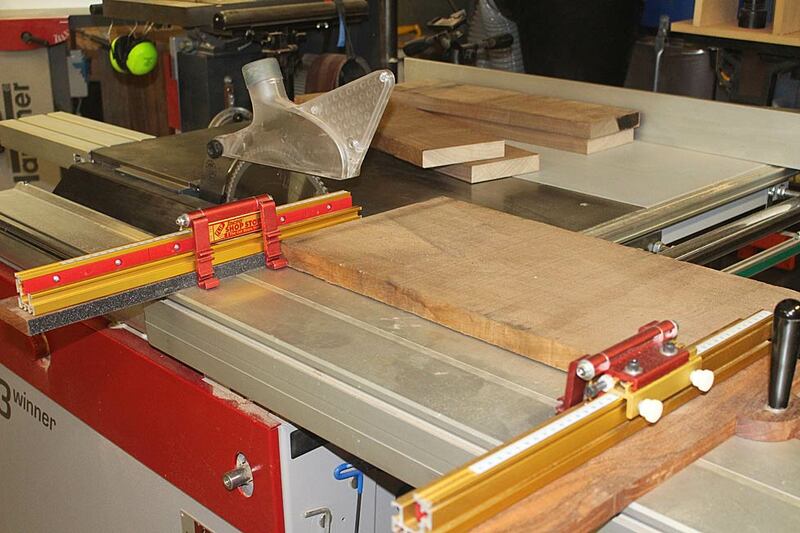 The jointer-planer/thicknesser I have is European, and metric. 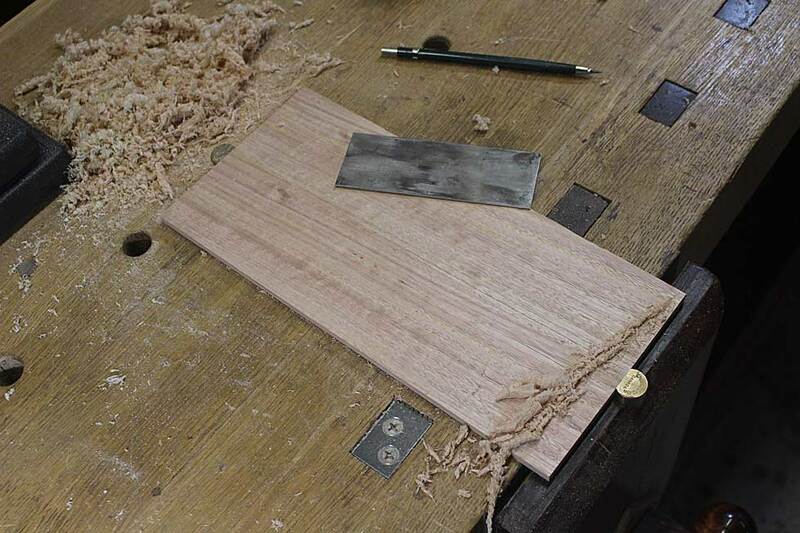 The hand tools, such as a plough plane, are imperial). 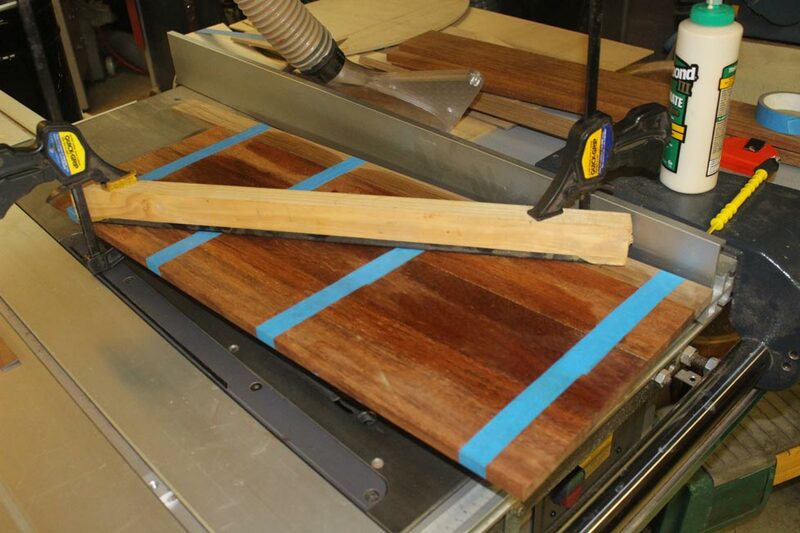 The boards are thicknessed a little oversize, glued up, and then taken to final dimension with hand planes. 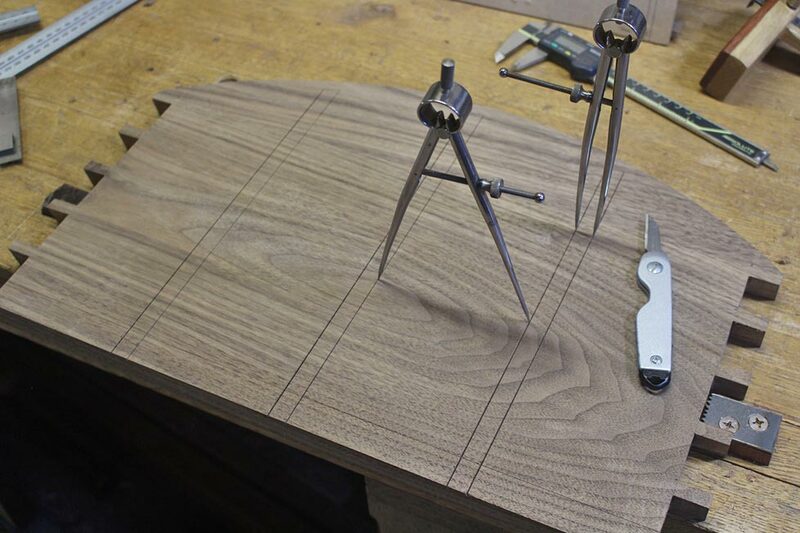 The walnut is so easy to plane. I get why so many rave about working with it. 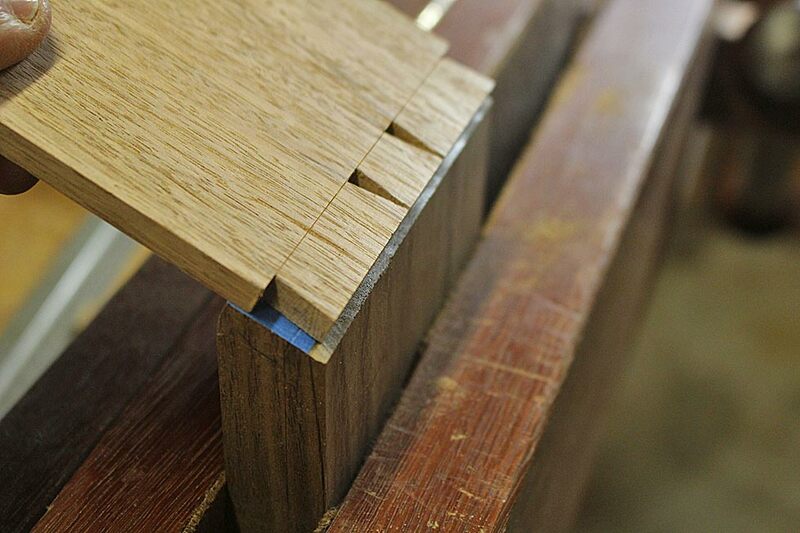 The dovetails are in the ratio of 6:1 – I felt the slightly extra wider base would add a little more authority. Note, also, the area that will need to be bevelled away. This is marked. 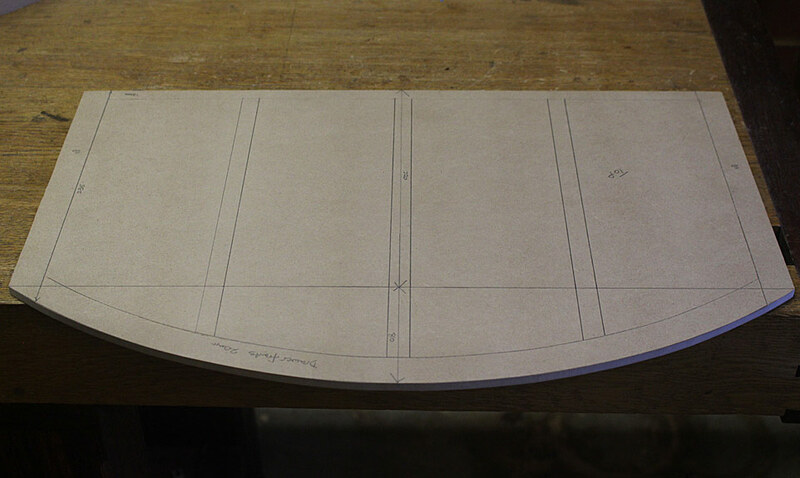 … and the curve is transferred to the other end of the panel. 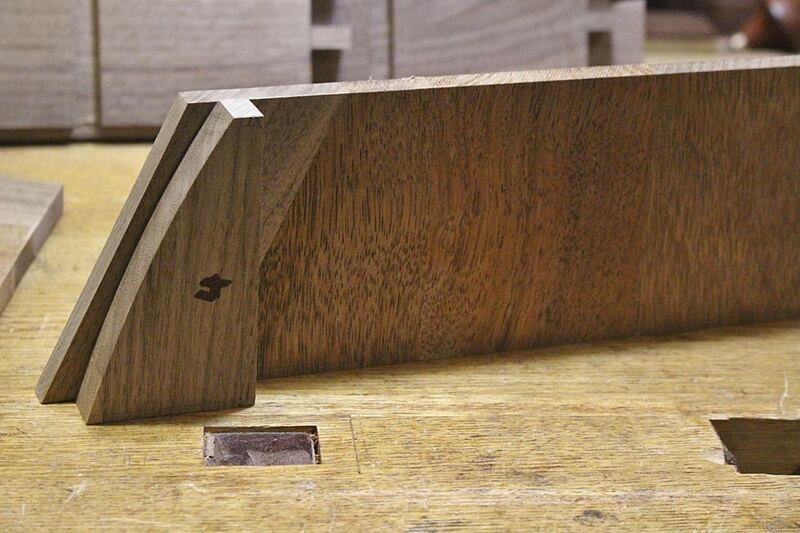 The reason for the trying plane is to keep the sides straight. 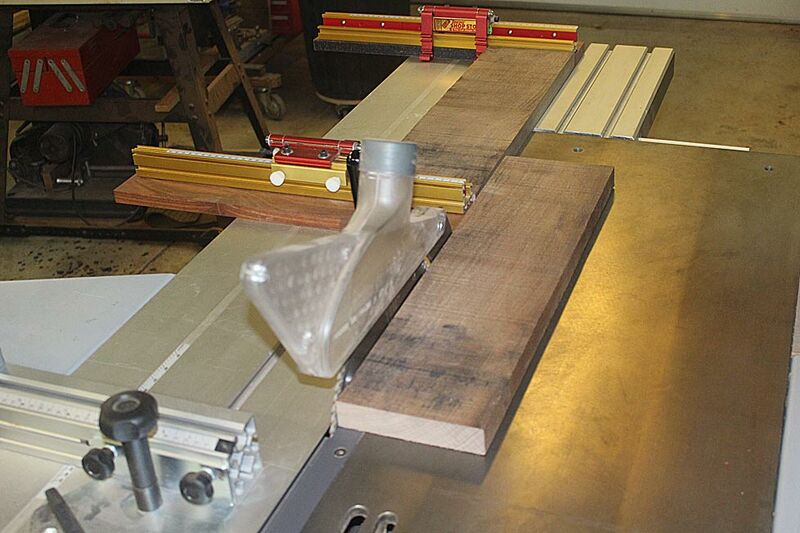 A jointer plane could have substituted. 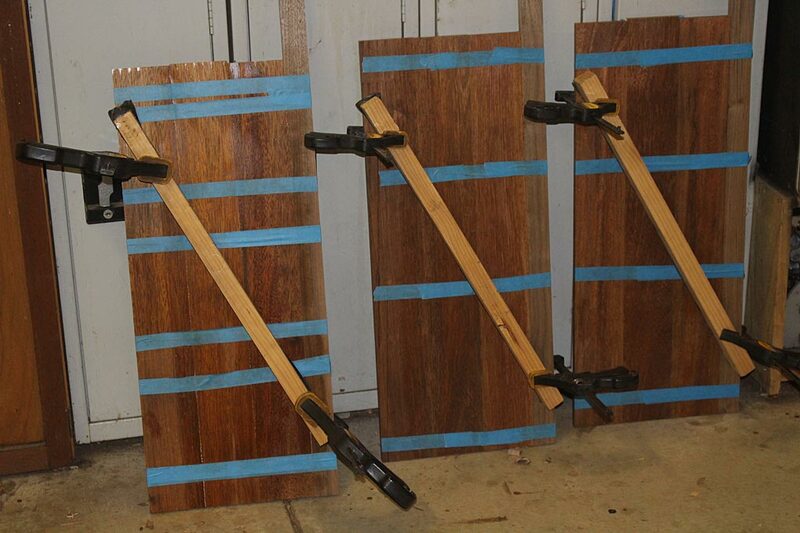 Merbau is from northern Queensland (some is imported from Papua New Guinea). 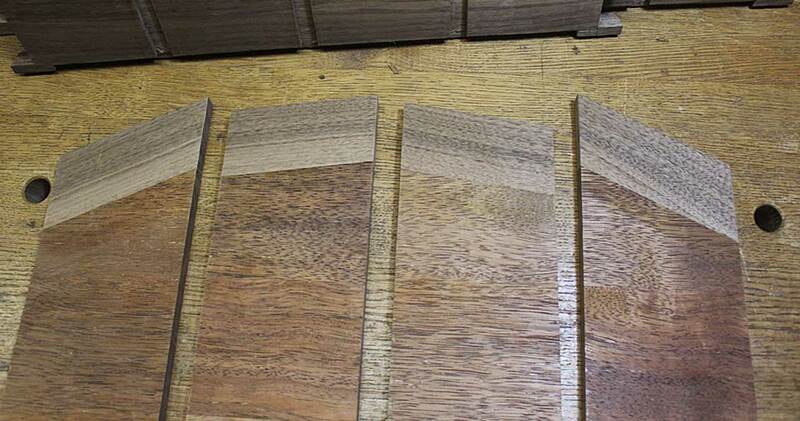 It is hard and heavy, and typically used in Oz for flooring or outdoor furniture. 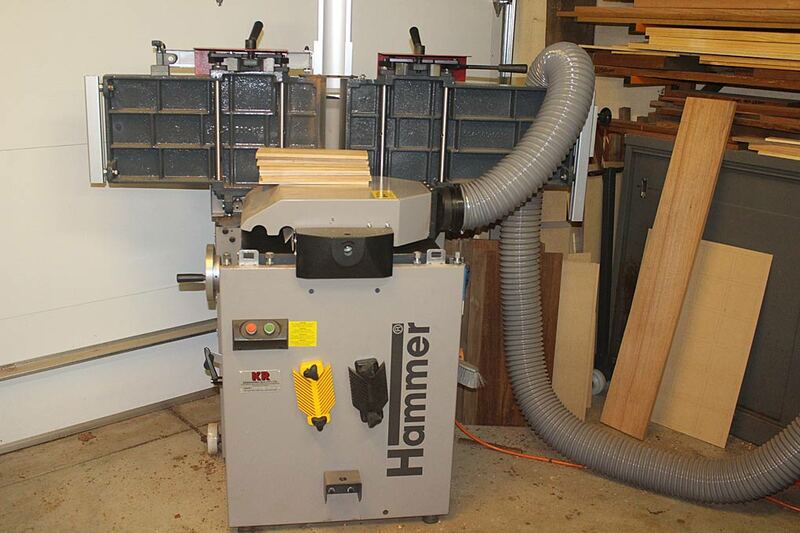 I am using it because it is cheap and hard. 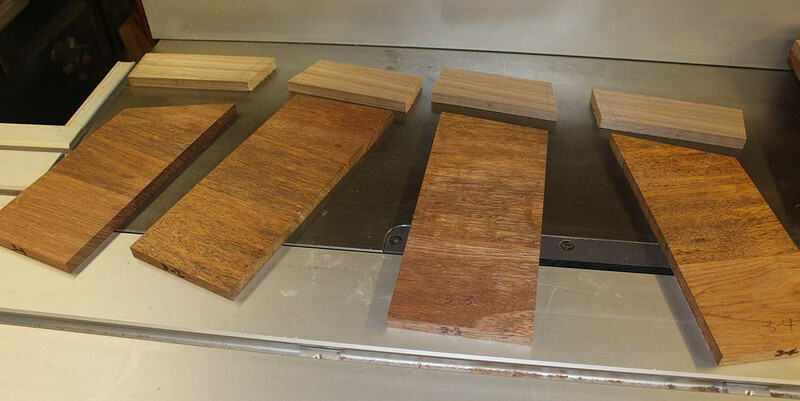 As cheap as pine and as dense and wear-resistant as jarrah. 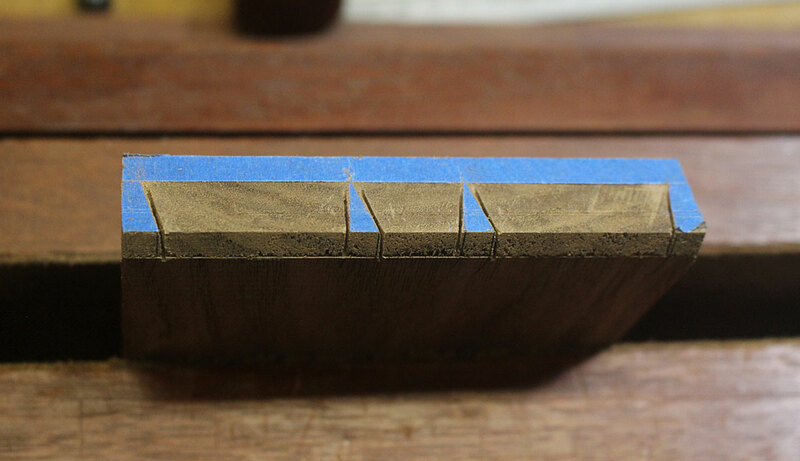 The boards are glued together and bound with blue tape ..
As before, they are also slightly oversize and will be planed to dimension to fit into 12mm wide dados. Wow! 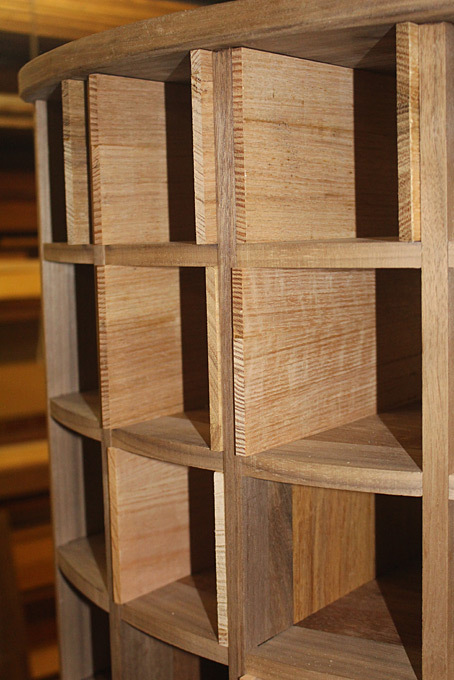 Beautiful work and such fine craftsmanship! 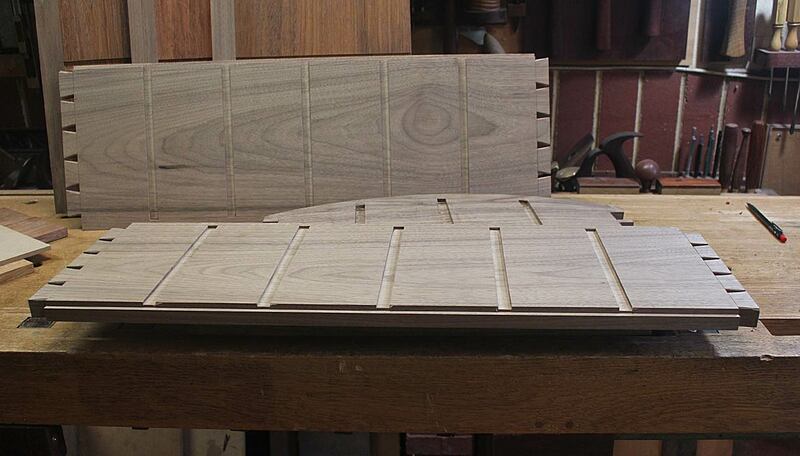 I'm looking forward to seeing the completed piece. Very nice work. 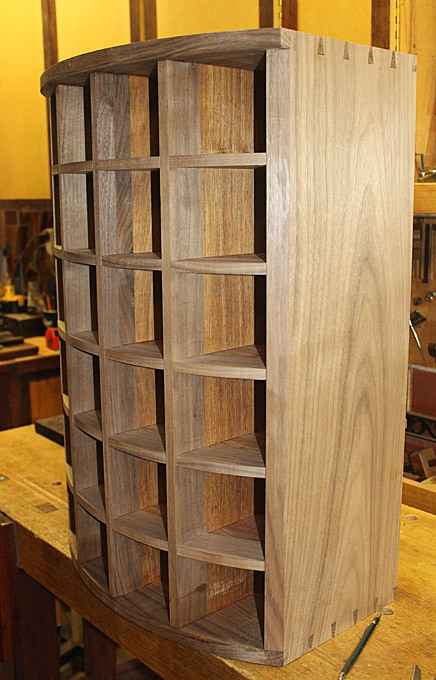 I look forward to seeing it finished. Great to see another project underway by you. 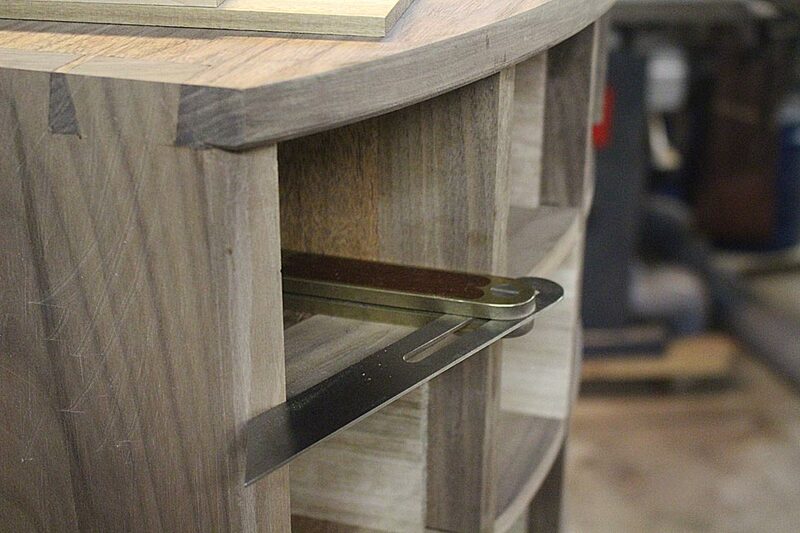 Looking forward to how you cut the drawers with that curved front! Derek, I'm looking forward to seeing your progress. 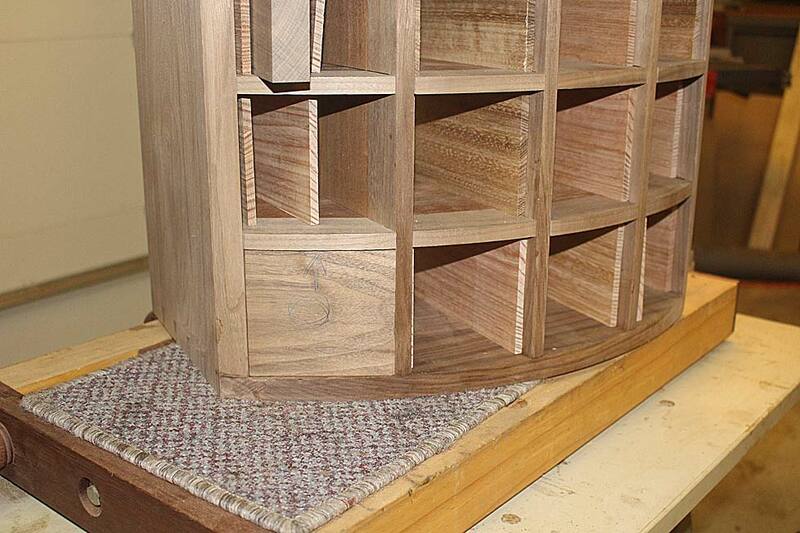 Looking great so far and I love that you include your thought process during design. Well done! 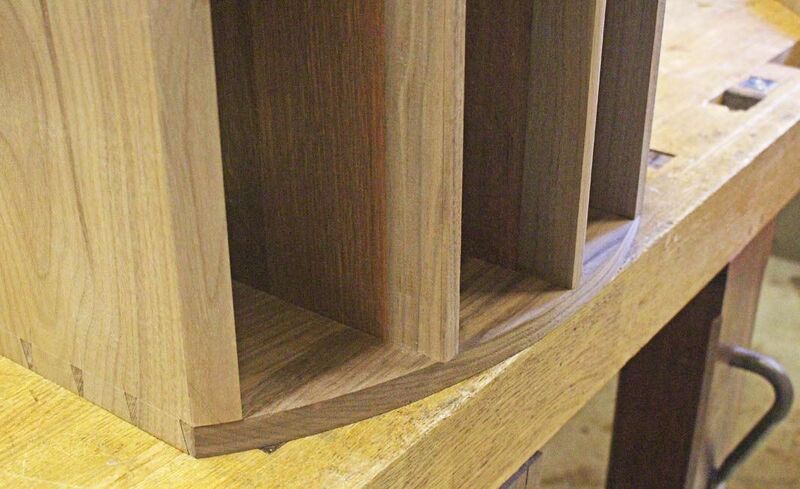 Great workmanship, and I love seeing the process. I'm looking forward to seeing future progress. 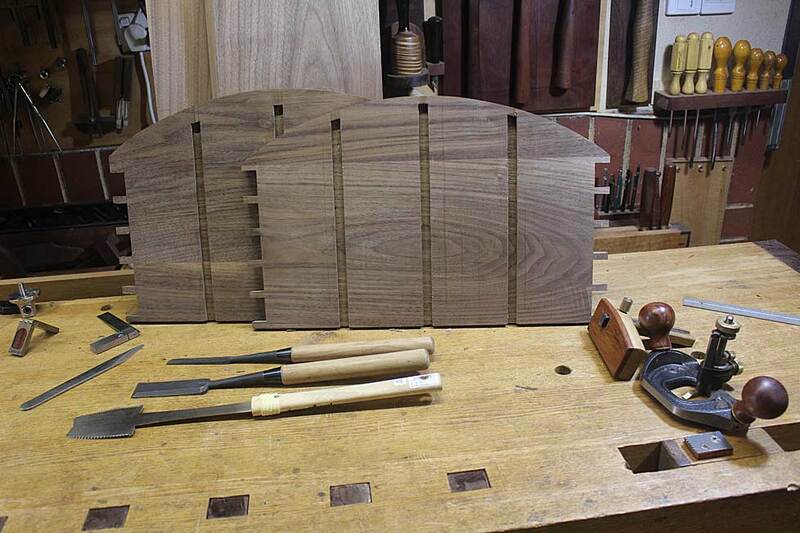 The Arts and Crafts style is my favorite, and I look forward to following along as you build this. 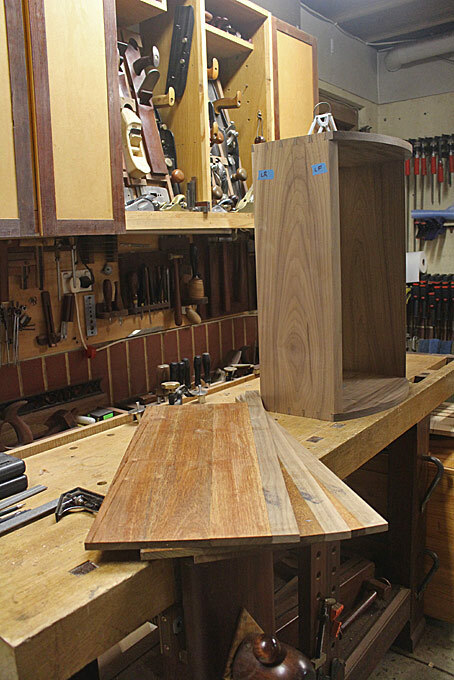 BTW, I have been reading your posts for years at Sawmill Creek and say thanks for all your efforts to post and photograph what you are doing in the shop. Many thanks all for the very kind words. 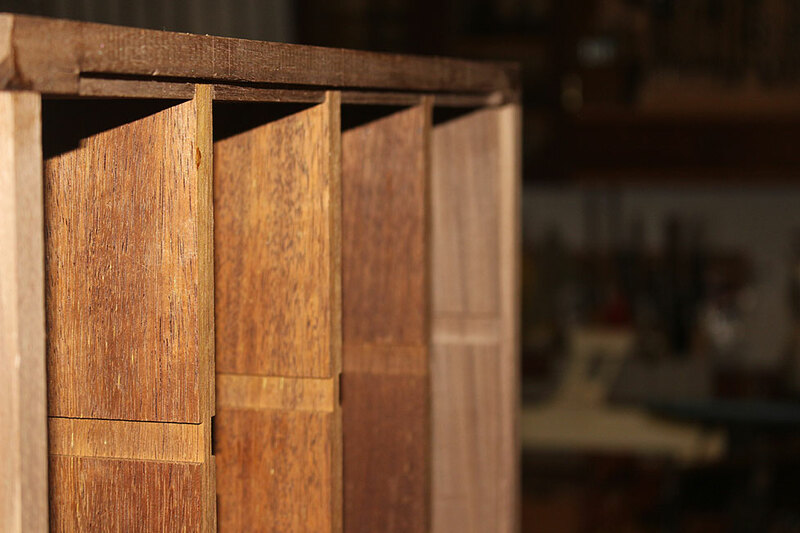 Here is ..
Wednesday was Anzac Day, a public holiday in Australia and New Zealand, and I had a few hours in the workshop to move along with the vertical partitions or dividers. 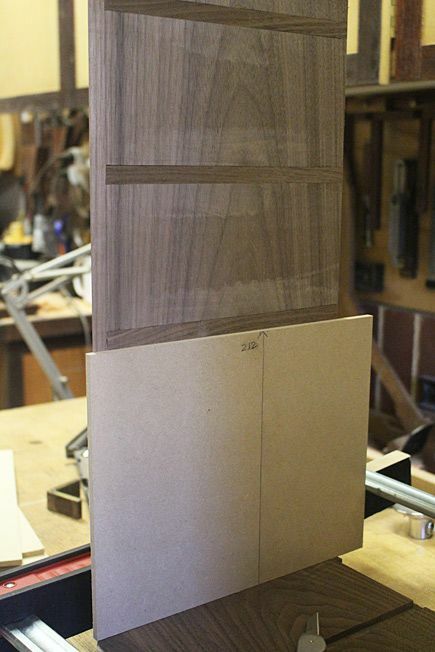 The panels had been thicknessed a little oversize. 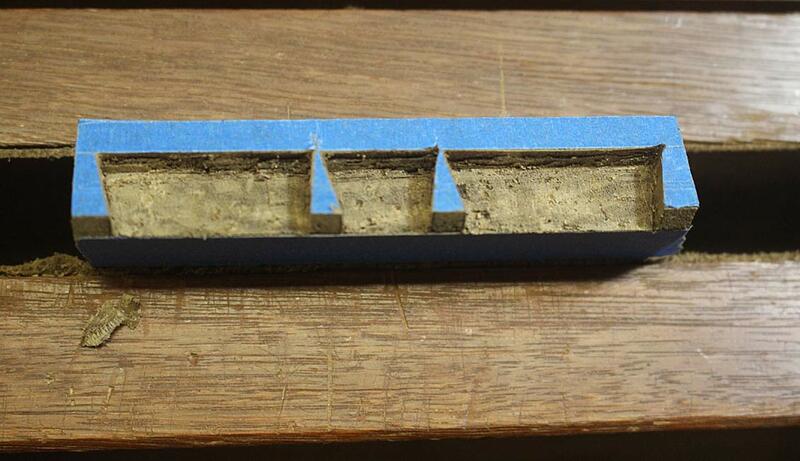 They need to be brought down to their final thickness of 12mm. 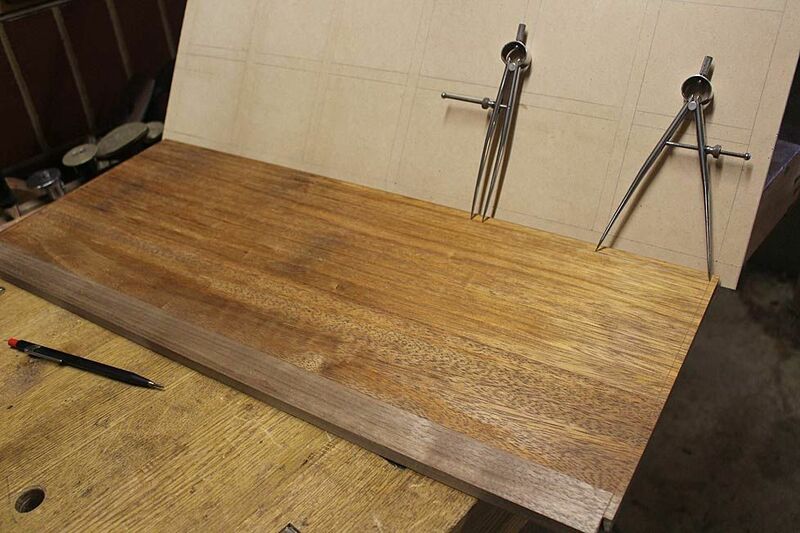 The base and the top of the cabinet is marked out for the stopped dados. 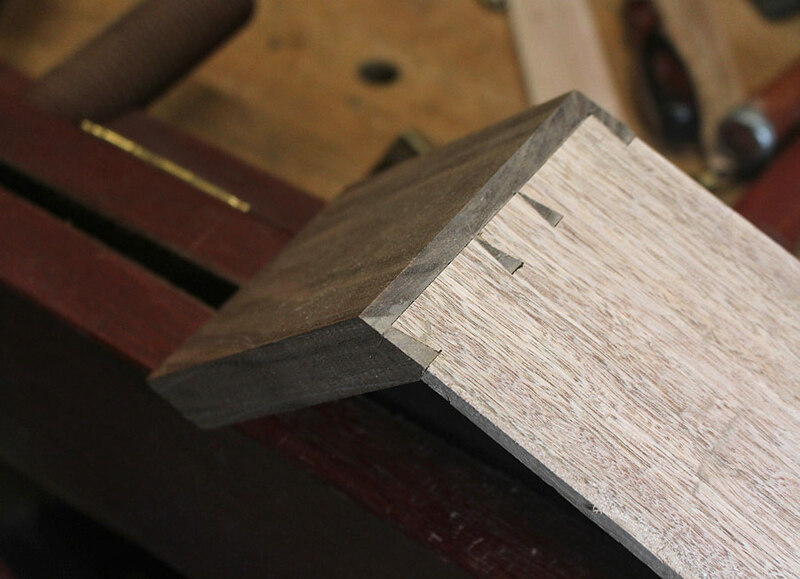 The dados end 10mm from the lower edge. 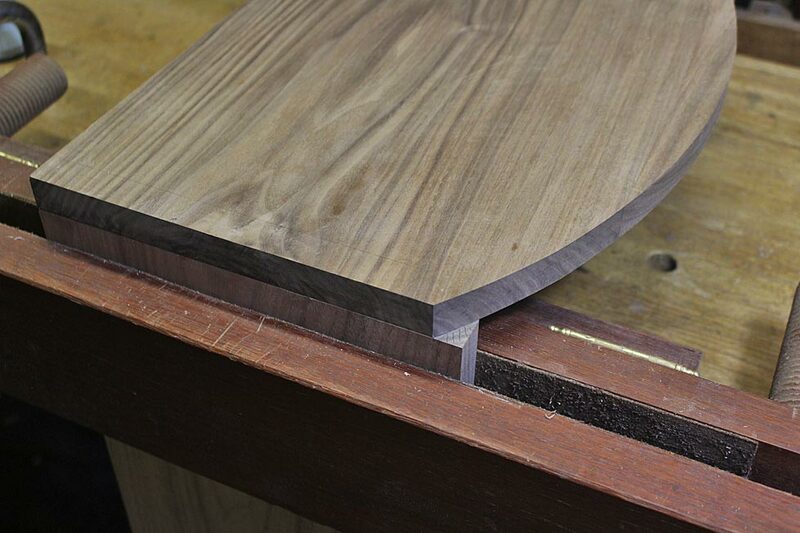 The upper section has a 12mm overhang to take into account. 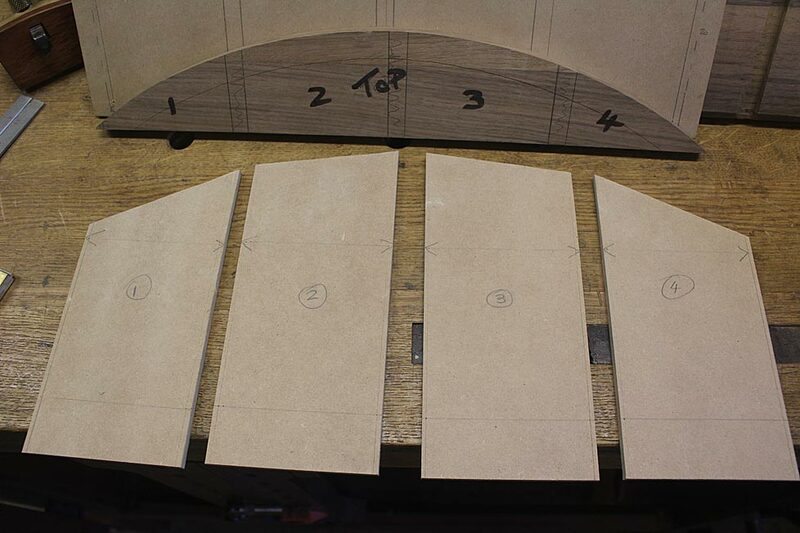 The ends are marked ..
... and then drilled to a depth of 6mm, which is the depth of each dado. 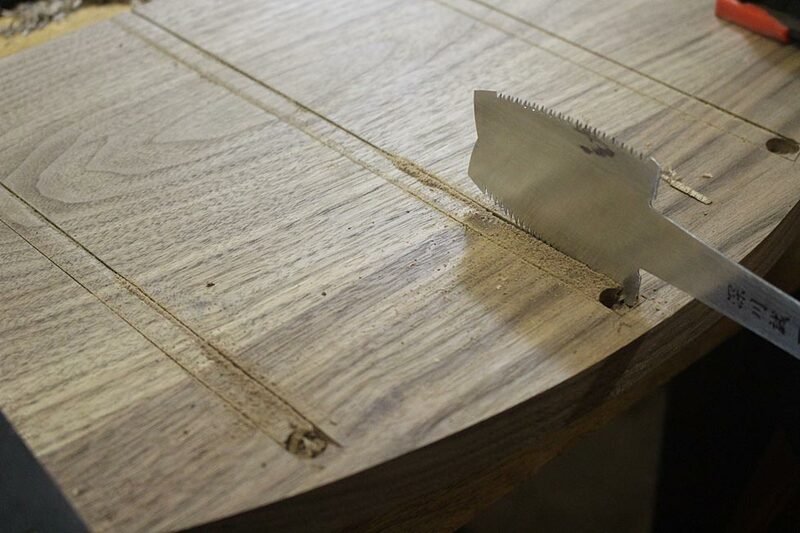 The sides of the dado are scored deeply with a knife, and a chisel wall is made along the length. 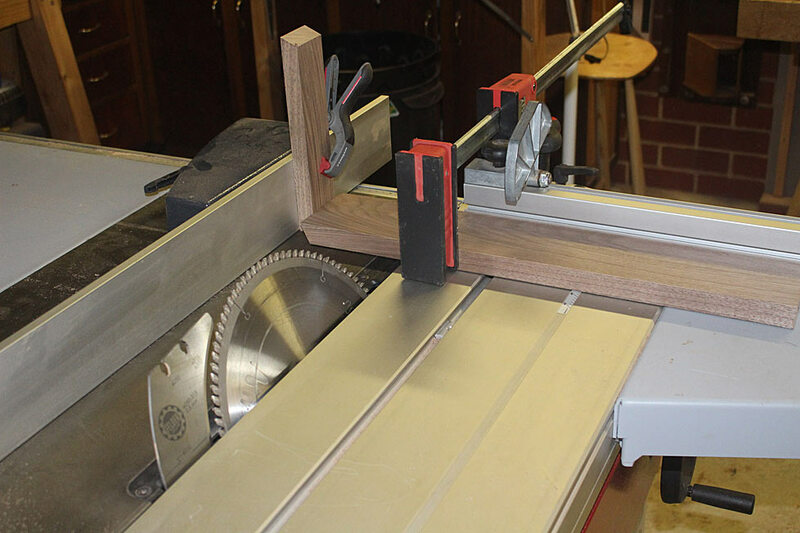 This is to guide a saw cut. 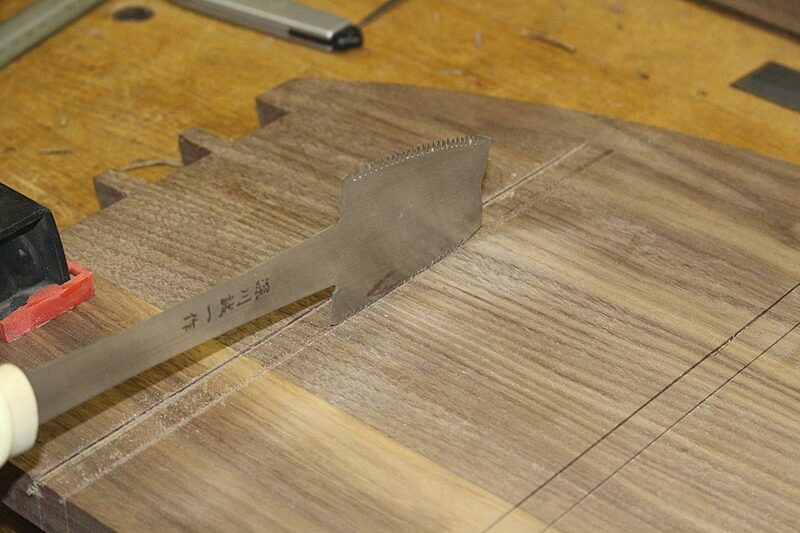 The kerf is created with an azebiki saw. 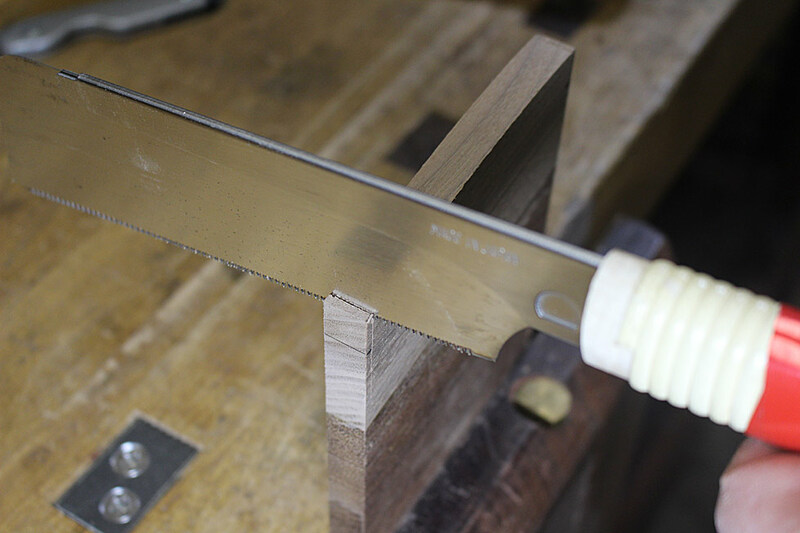 This is the traditional Japanese saw for cutting sliding dovetail joints, trenches and slots for sliding Shoji screens. Great stuff! Dereck, you are definitely the HAND MAN. 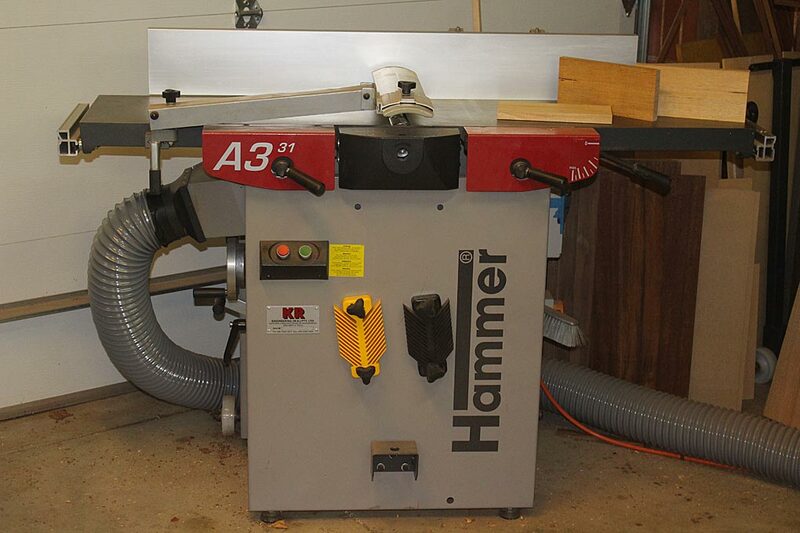 Seeing your and others handwork has led me reevaluate my mechanized work and cost me a bunch of money on Lie Nielson, Veritas, and Japanese saws. 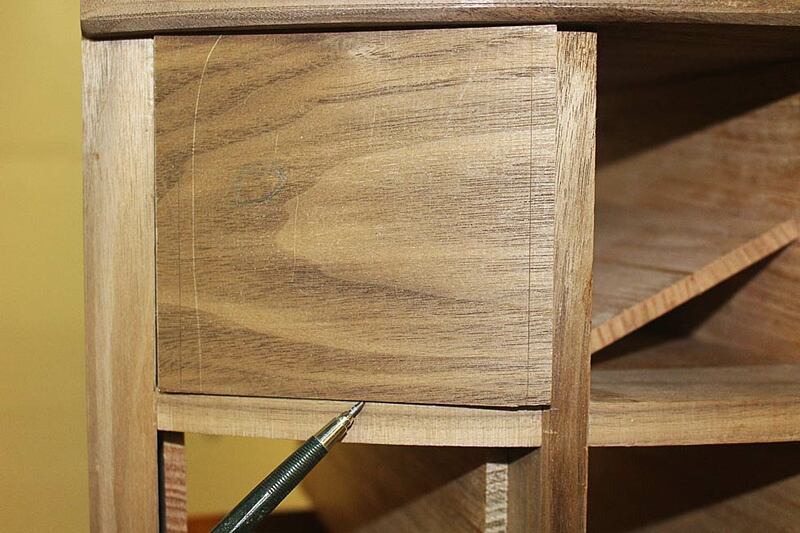 Note that all measurements and marking is done from the lower end of the carcase/dividers. 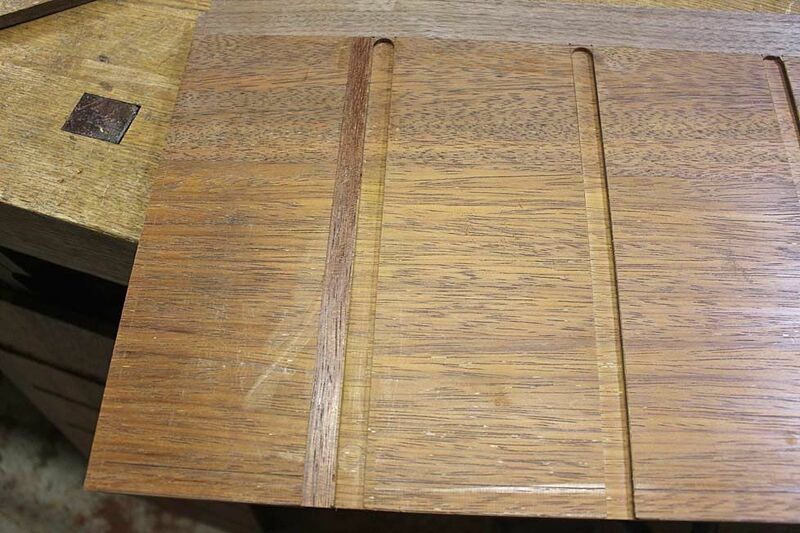 This is the reference end. 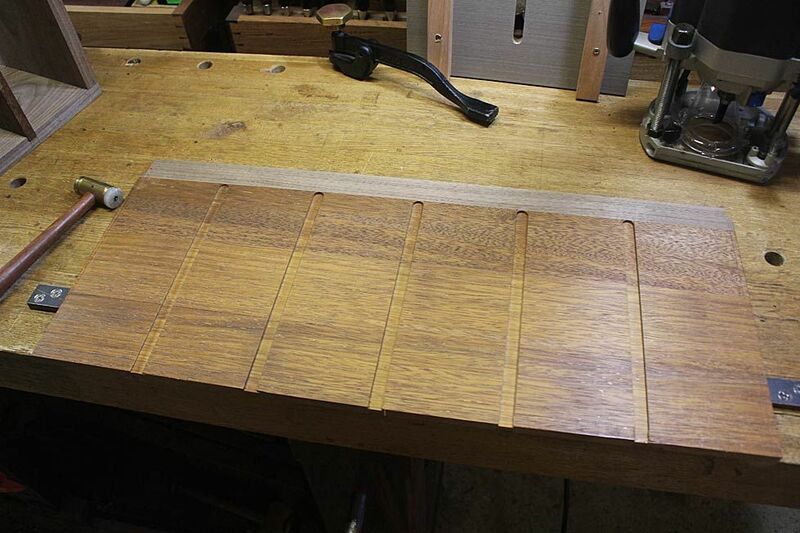 Finally all the stopped dados are marked. 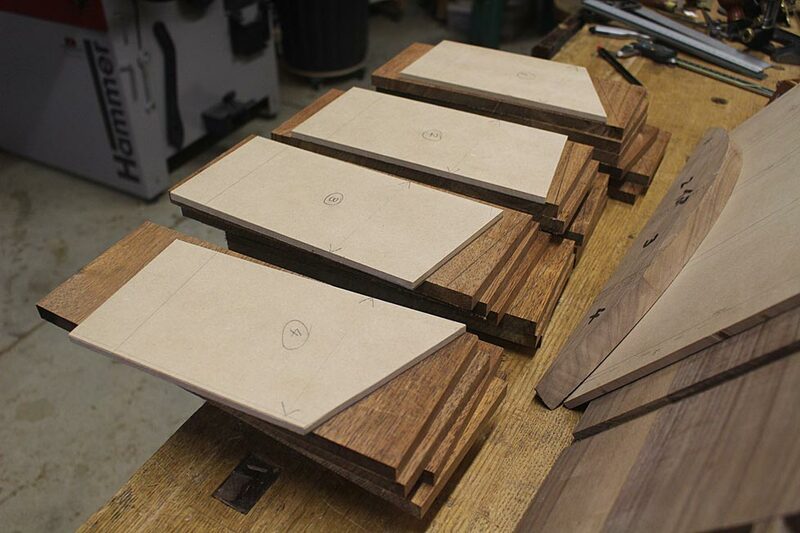 There are 40 in all - 10 in walnut and 30 in merbau. 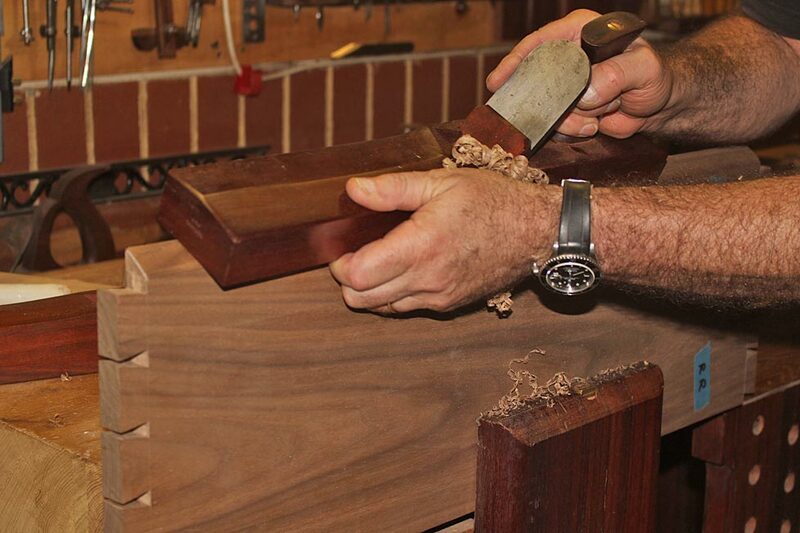 The merbau is an extremely hard and brittle wood. 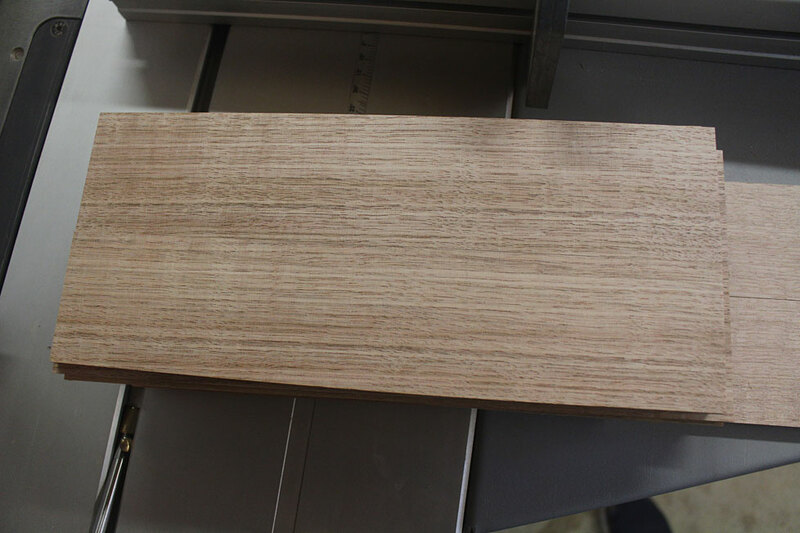 It was chosen as a secondary wood as it was cheap and will stand up to any wear from sliding drawers, unlike a soft wood like pine. 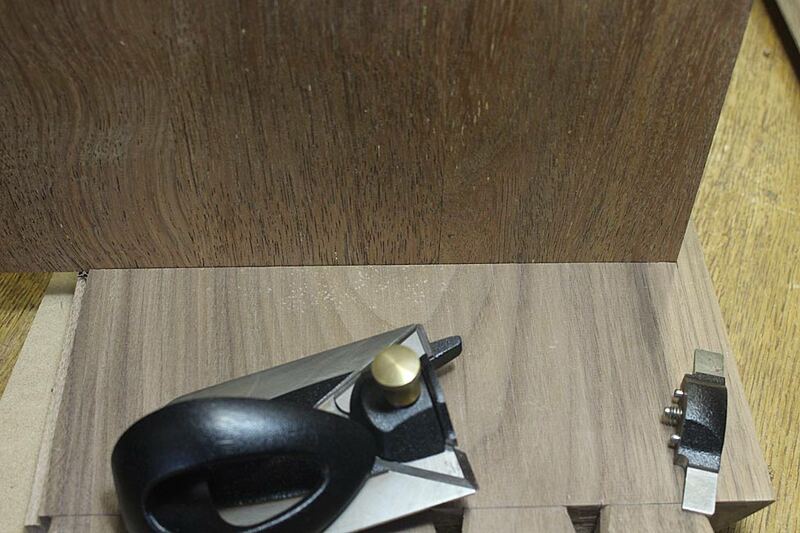 The dados are 3mm deep (as 12mm wide). 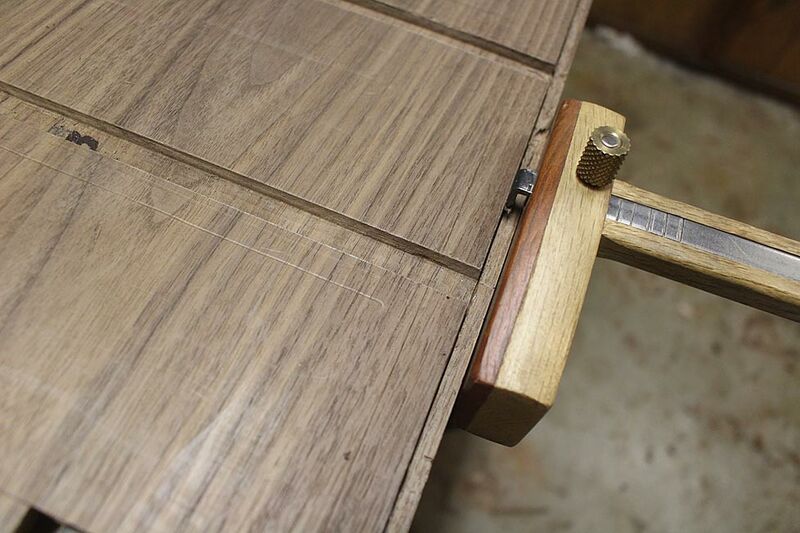 With a 12mm thick panel, and 3mm from each side, there will be 6mm remaining. 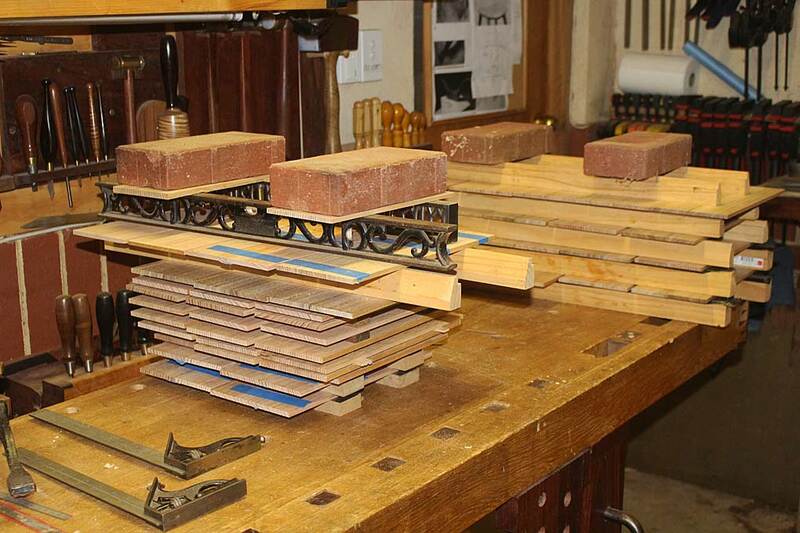 That is sufficient for structural integrity. 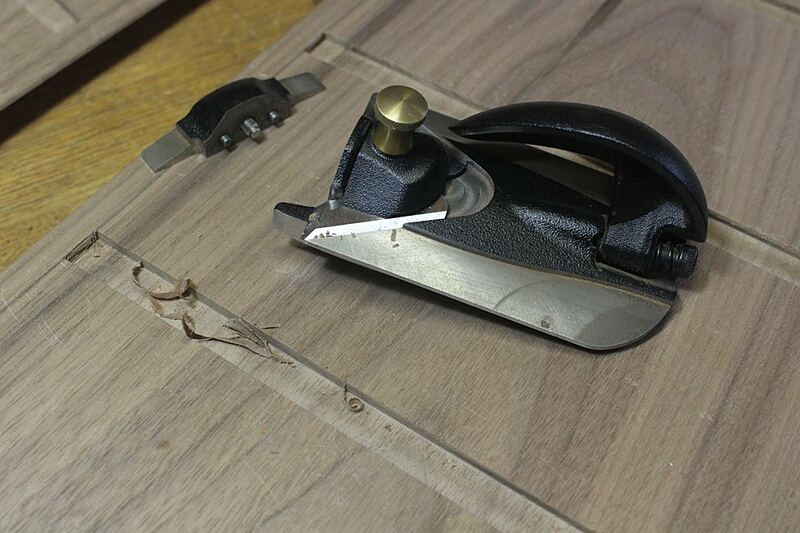 ... and I become complacent, and cut against the wrong line! Fortunatley, this is a simple fix and will not be seen .. So, at the end of the day the chest is dado-ed to death. 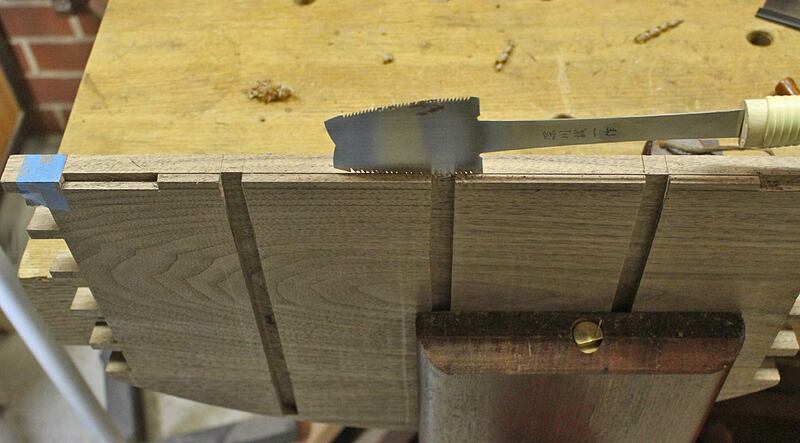 The horizontal drawer blades will be fitted next time. 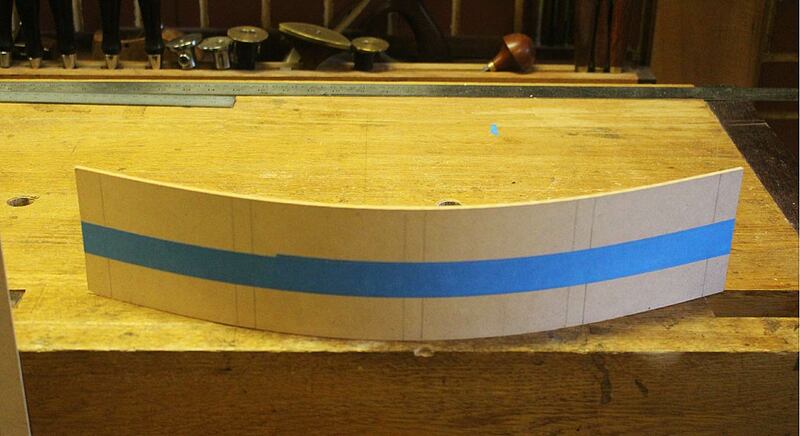 This is going to be an interesting time since they will curve to fit at the front. Coming beautifully. 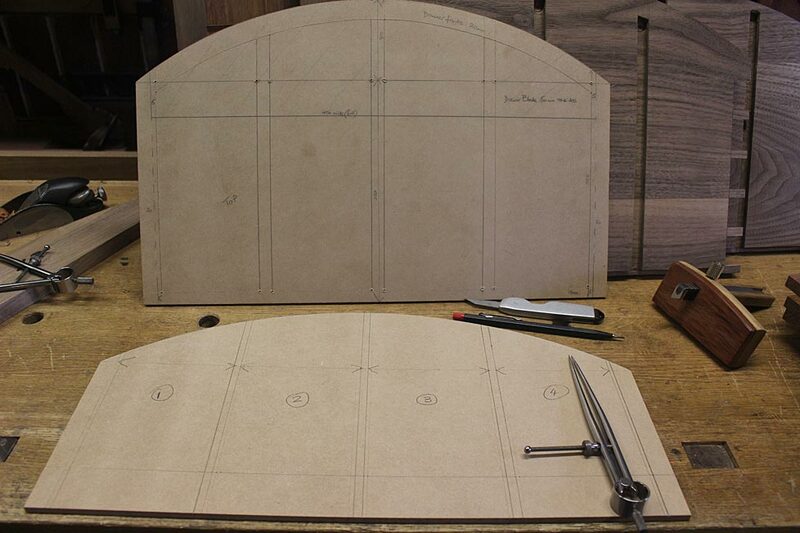 Looking forward to seeing the process pics for rounding over the dividers to match the curve. Ahhhh, so someone else besides me has run the router on the wrong side of the line ! Thanks for the update, Derek. This is the work completed this weekend. 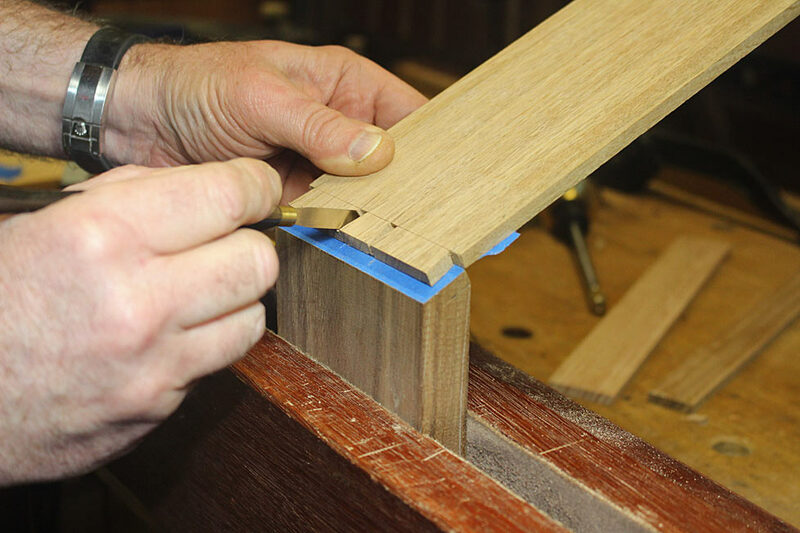 It includes rebating the rear of the carcase in preparation for the back (at the end of the build), tuning up the dados for the horizontal drawer blades, and building the drawer blades. 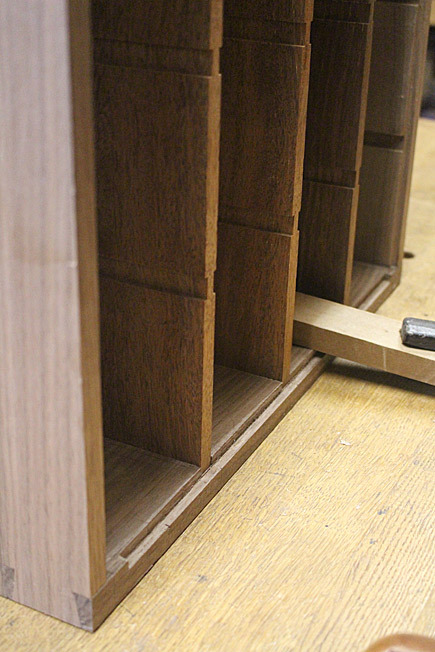 Rebating the side panels of the carcase is pretty straight forward. 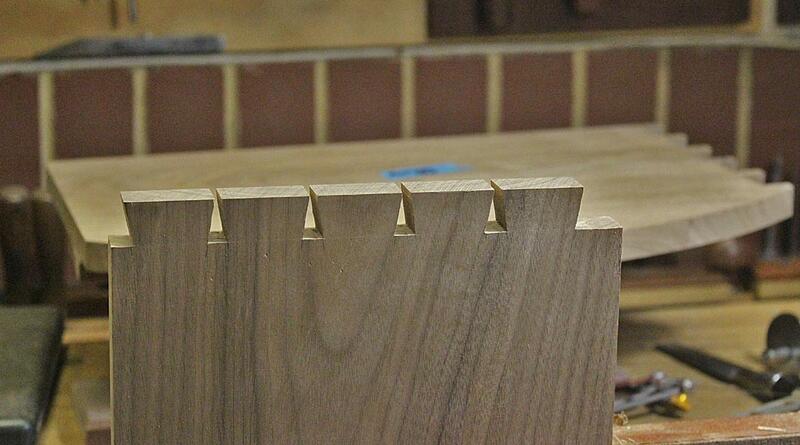 The rebate is 6mm x 6mm. 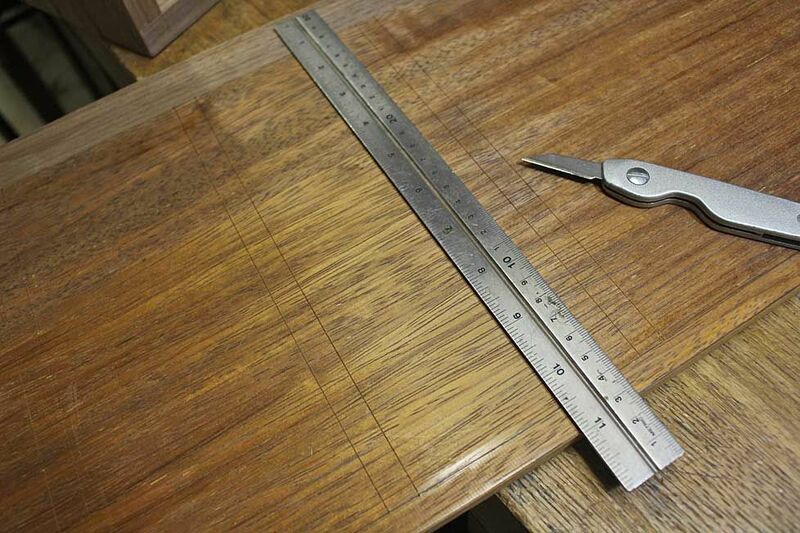 Planing the full width is unobstructed. 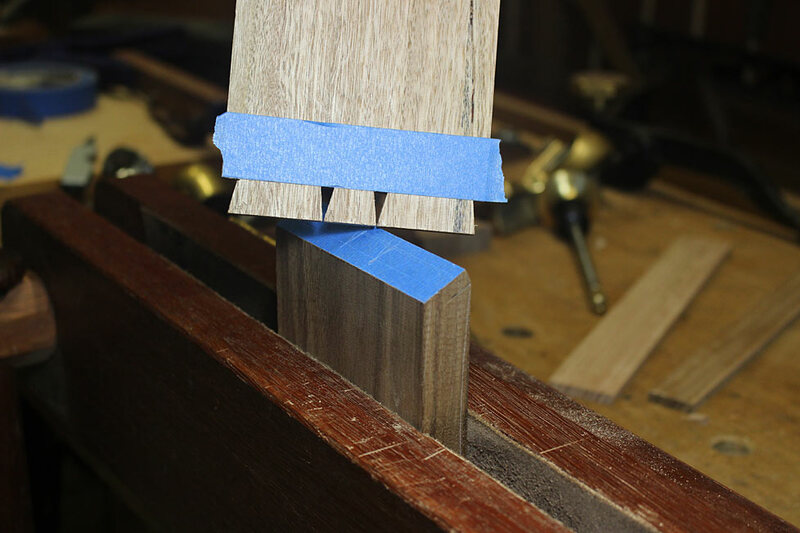 However, where the upper and lower panels need a rebate, planing through will lead to gaps in the panels as these end in dovetail pins. 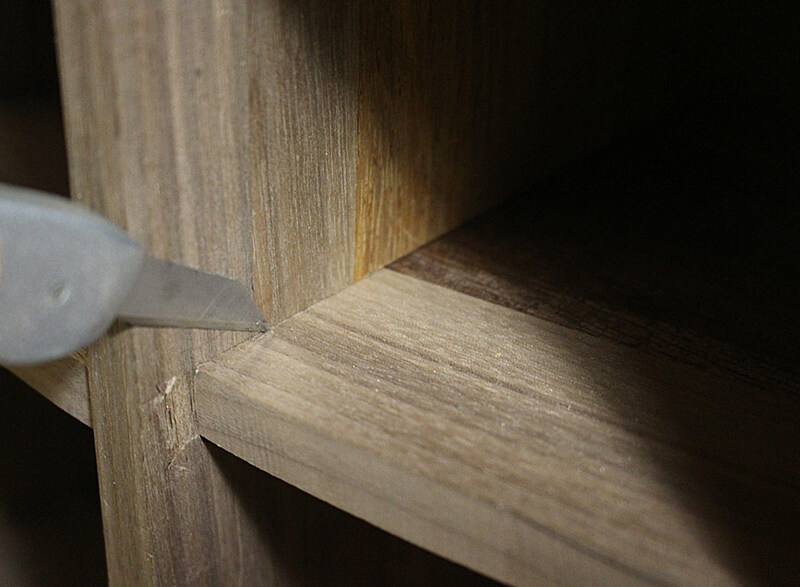 There would have not been an issue here had I used mitred dovetails, but this was an oversight at the time. Now I have a couple of choices, one being that I add a bead around the read panel, however I do not want additional adornments on the chest. 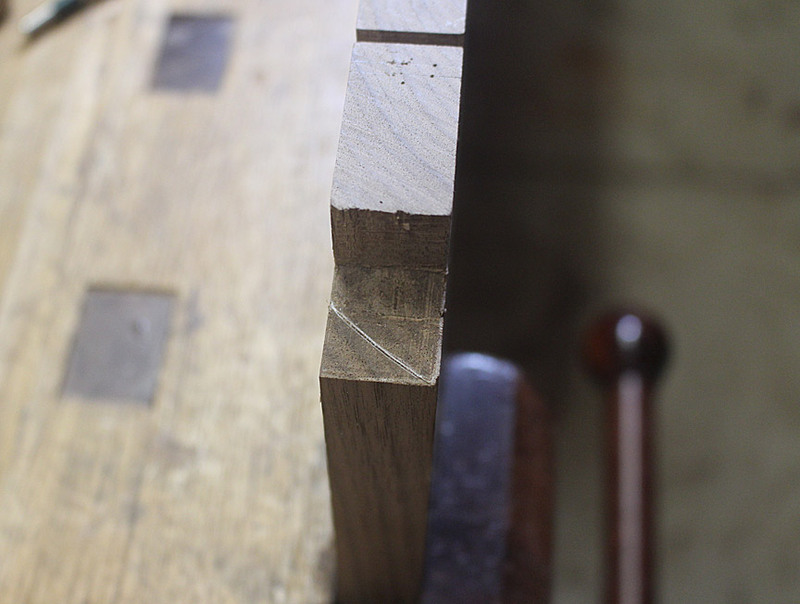 Instead, they will stop short of the end at this stage, and the remainder chiselled out after the carcase is glued up (glueing up will support the weakened pins) .. 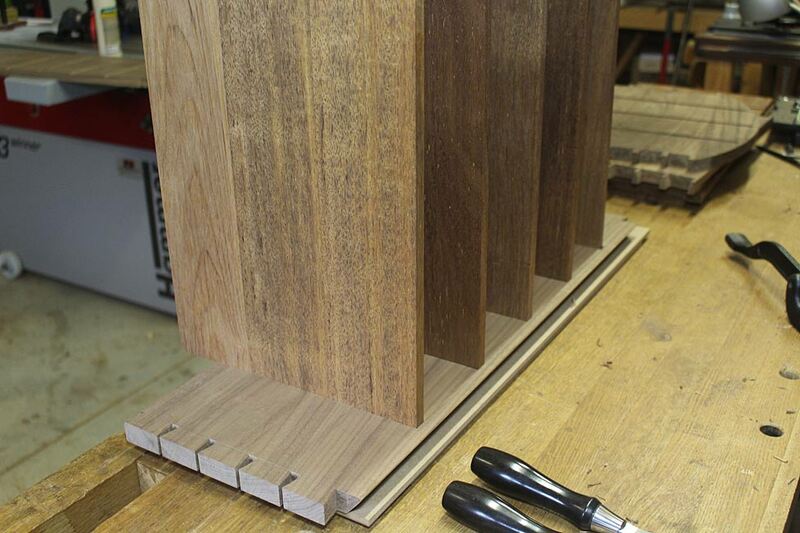 The strategy for the dados was to make them 20mm with a power router, which was done, and then fit panels to these. 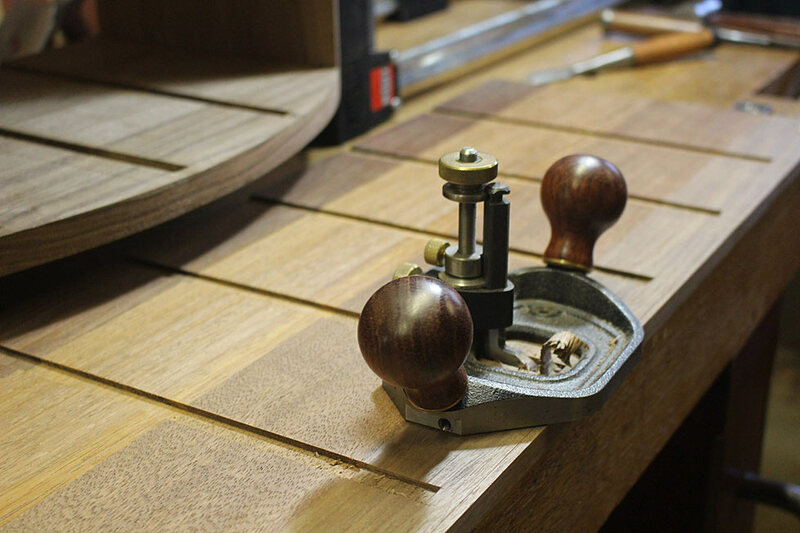 The panels were completed with the assistance of a jointer-planer/thicknesser, and this made it easier to dial them close to 20mm. 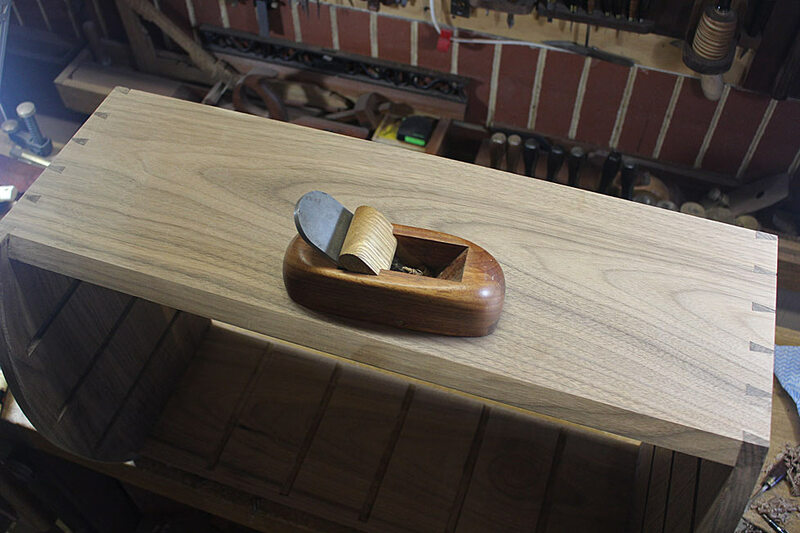 Final surfacing was with handplanes. 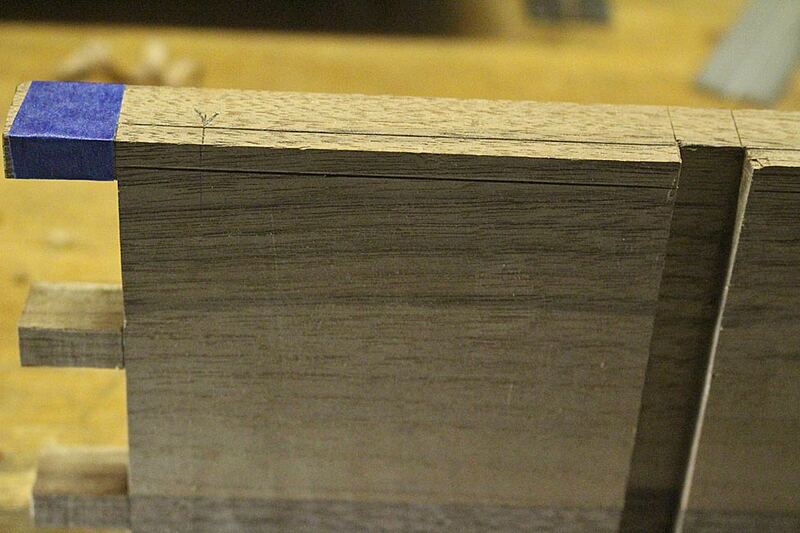 Although the dados were made with a brand new 20mm straight bit, they were not as precise as I would have expected. 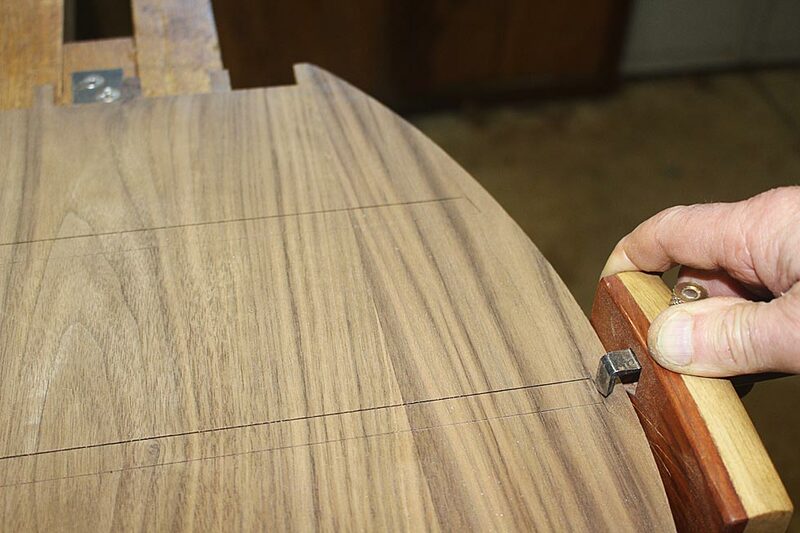 A little tuning was necessary to bring them to width. 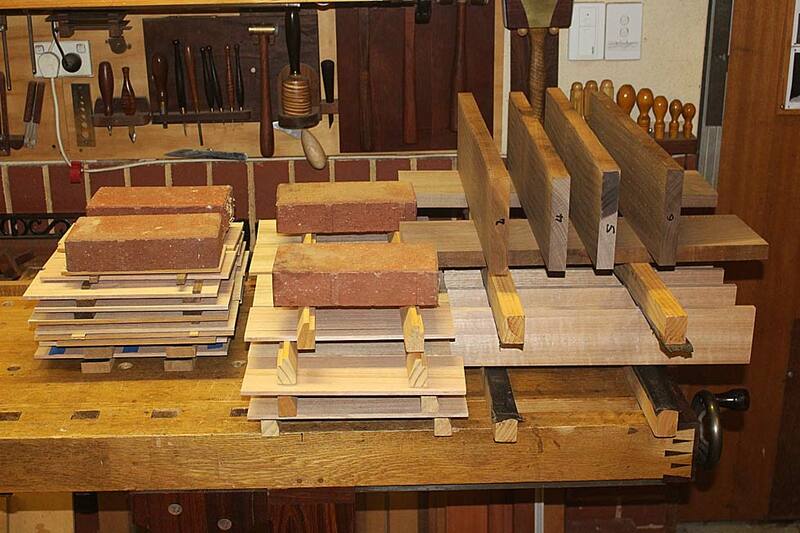 A total of 40 dados needed to be tuned (that took a few hours!). 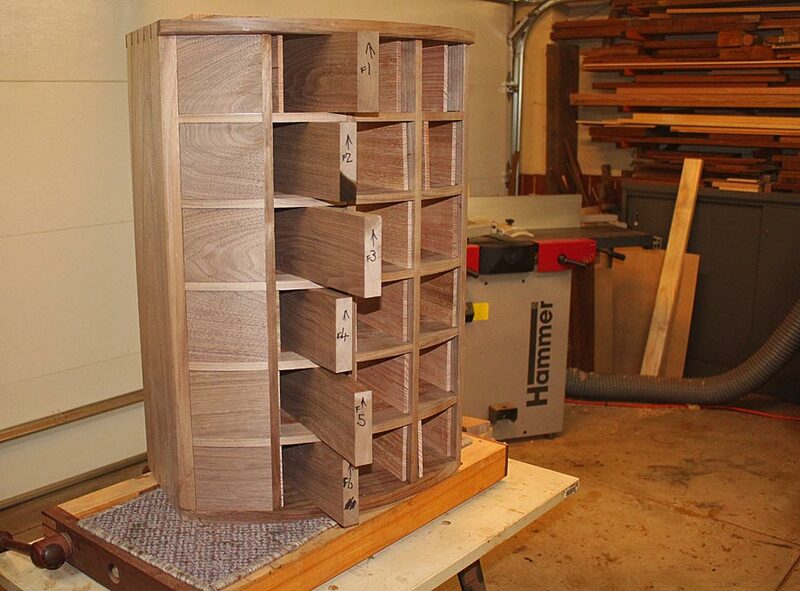 The drawer blades below are, in fact, for the 24 drawers, and will be cut to fit the compartments. 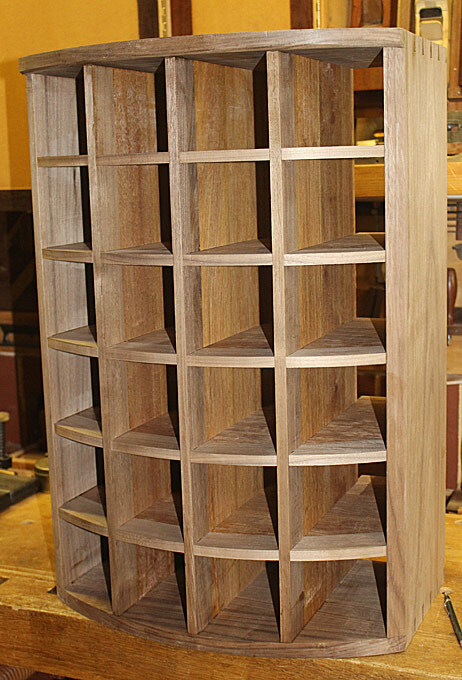 The design of the chest called for vertical dividers. 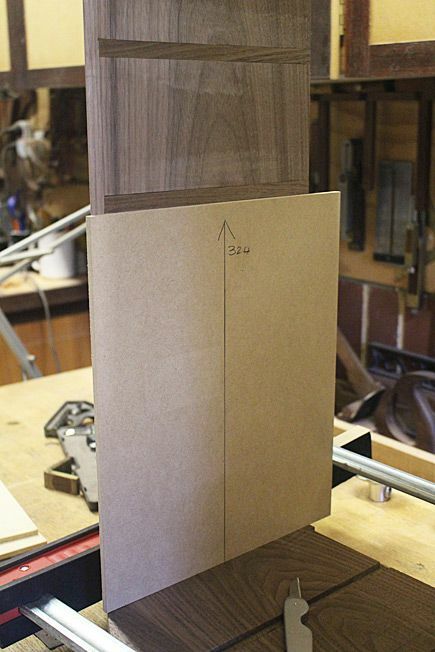 This would create an emphasis on the vertical. 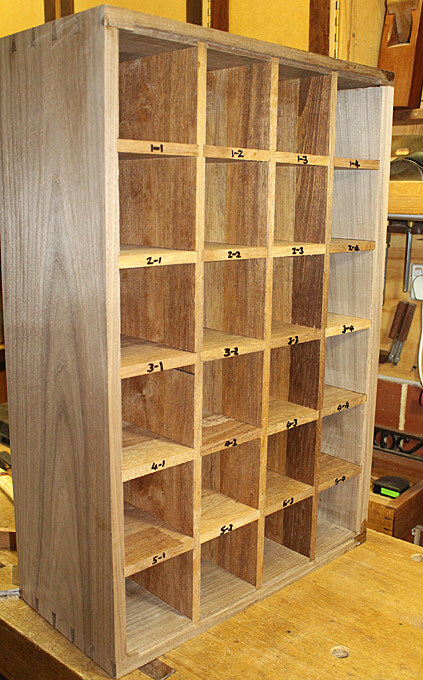 Every apothecary chest I have seen used horizontal dividers/drawer blades as the primary construction. 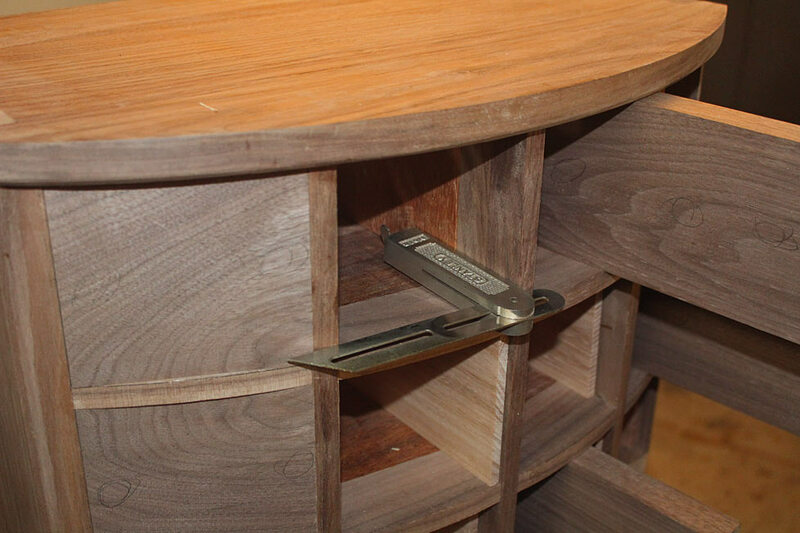 It would have been a lot easier to have done so as well since the bow front could be shaped in, and then the curved drawer blades attached to the carcase. 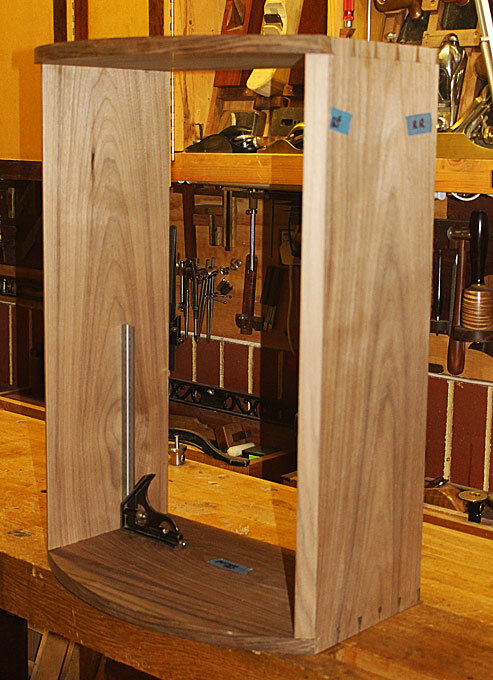 This would have been followed with the individual vertical dividers which, while needing to be aligned, would be straight and uncomplicated to align. 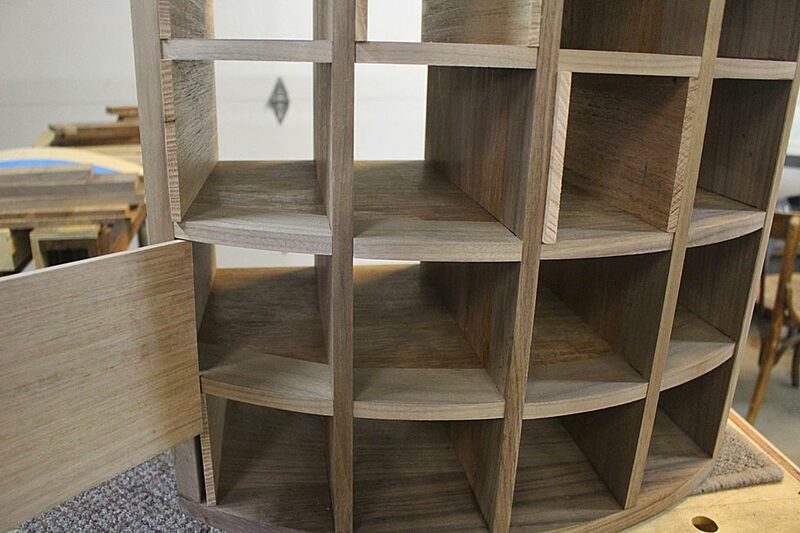 Starting with the vertical dividers meant that the bowed horizontal drawer blades presented a complication with alignment. This was similar to the plan drawn up at the start. 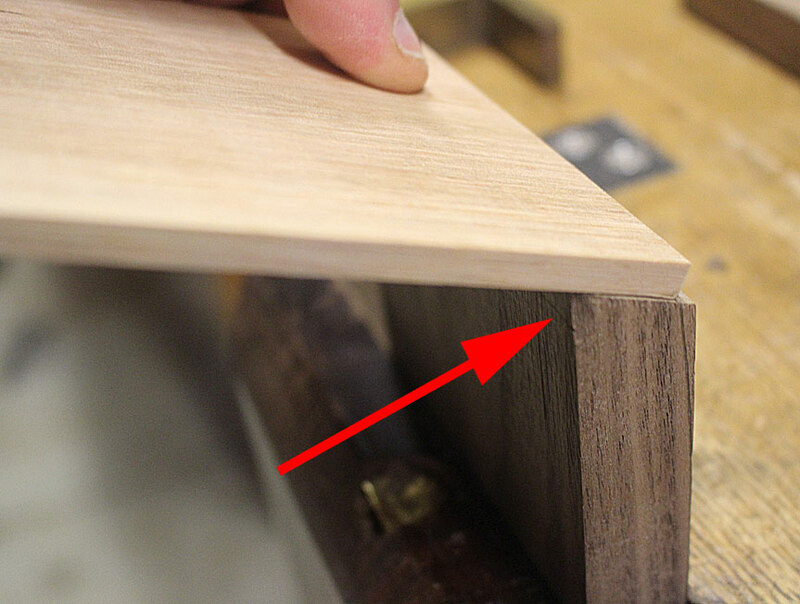 It differed in that it represented the drawer blades plus the area seated into the 3mm deep dados. 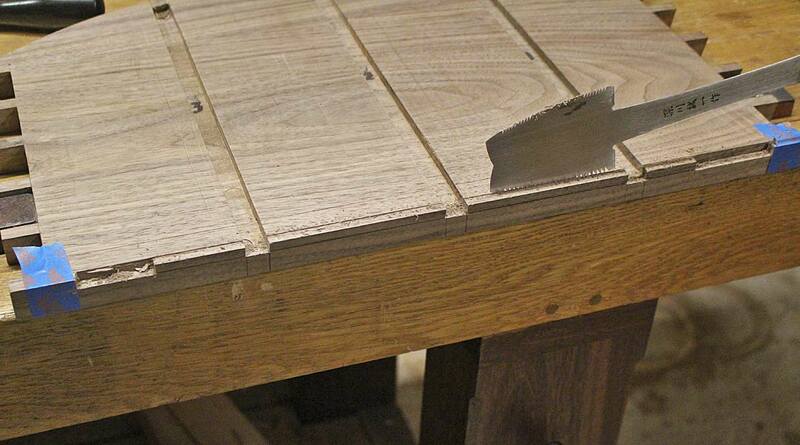 In the meantime the (horizontal) drawer blades were sawn to size. 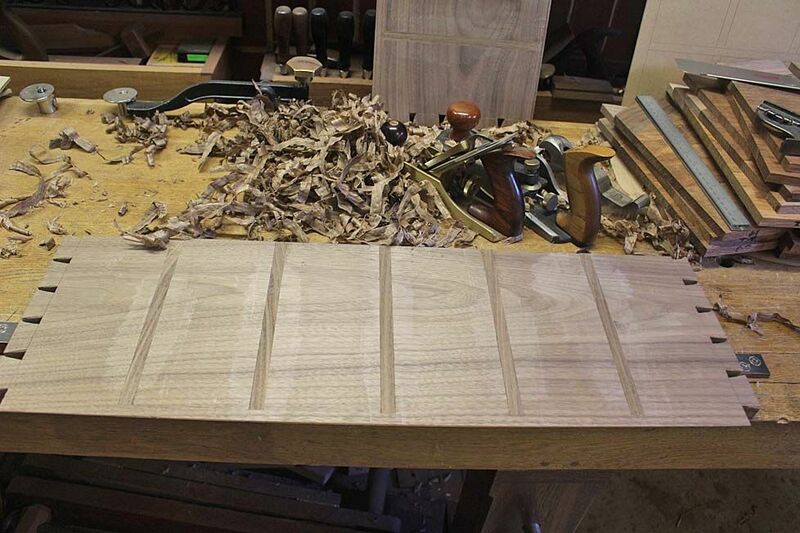 Not that the grain for all runs across the width of the chest. Expansion takes place front-to-back. 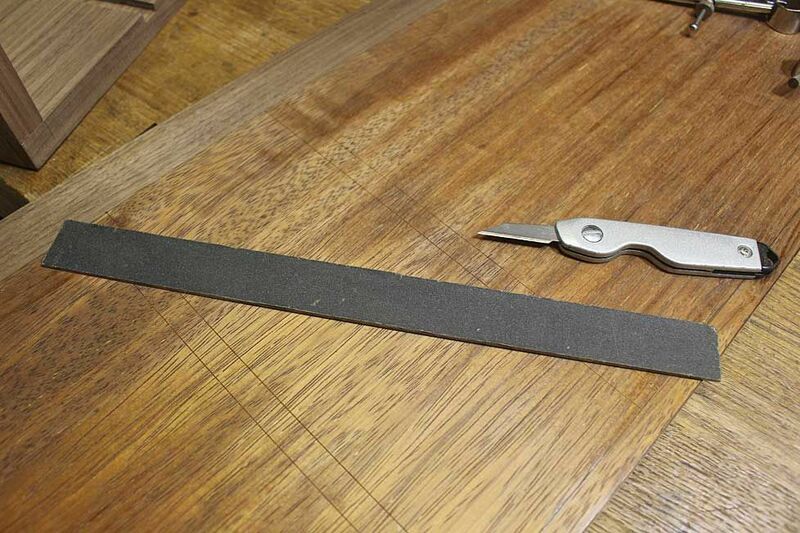 These are glued with the aid again of blue tape ..
Another nice tutorial . I'm looking forward to seeing what you've done this weekend. 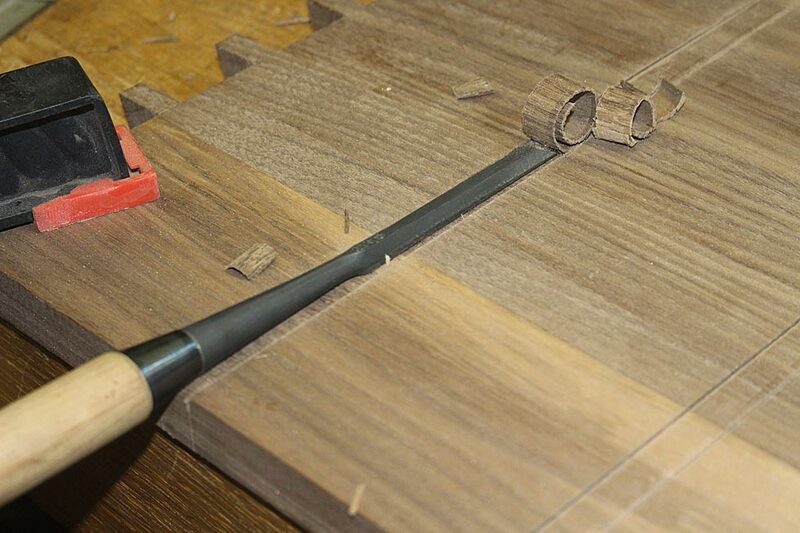 At this point the build came to a grinding halt. 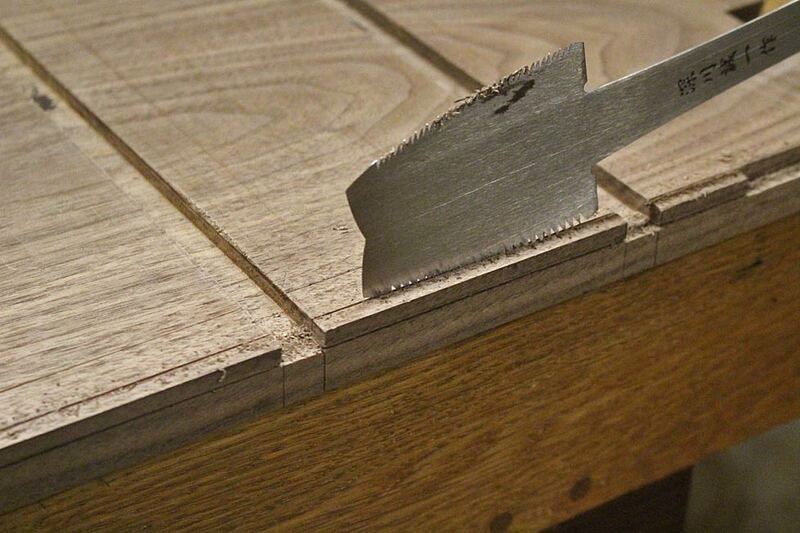 The drawer blades ... dados ... were not coplanar ... level ... darn! 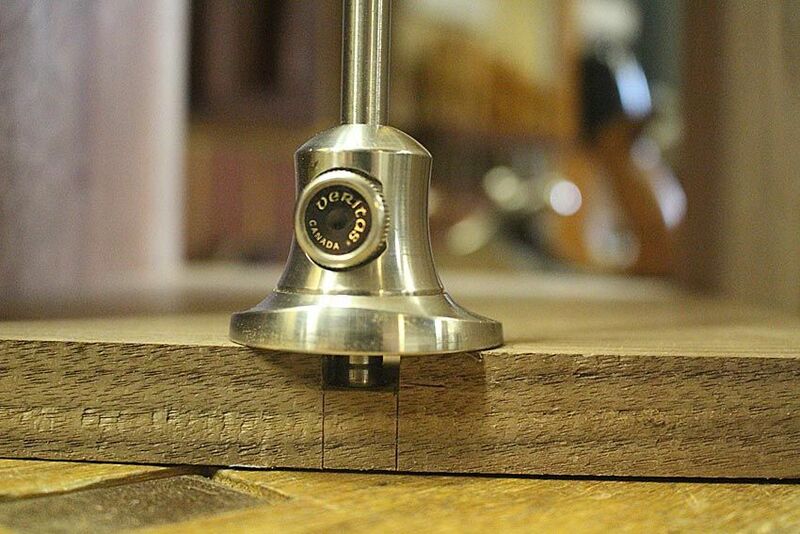 We are talking a millimetre here-and-there, but the combination looked terrible. 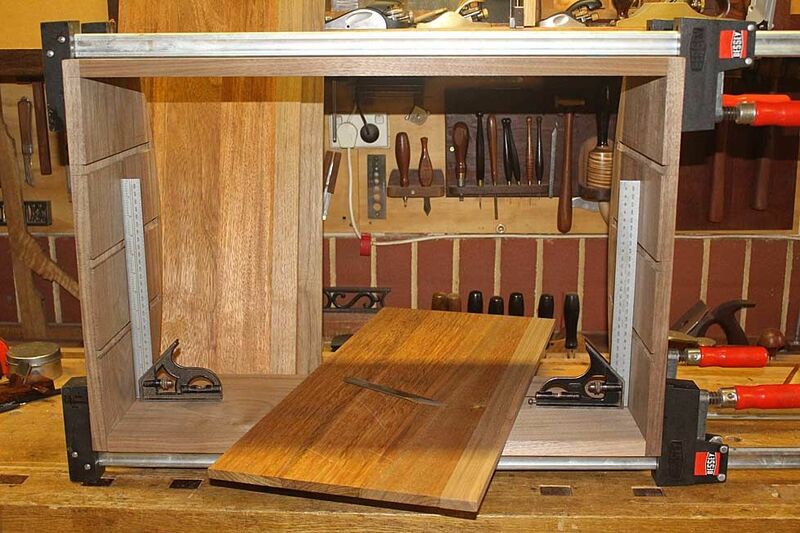 Very nice fix, and a great looking cabinet. 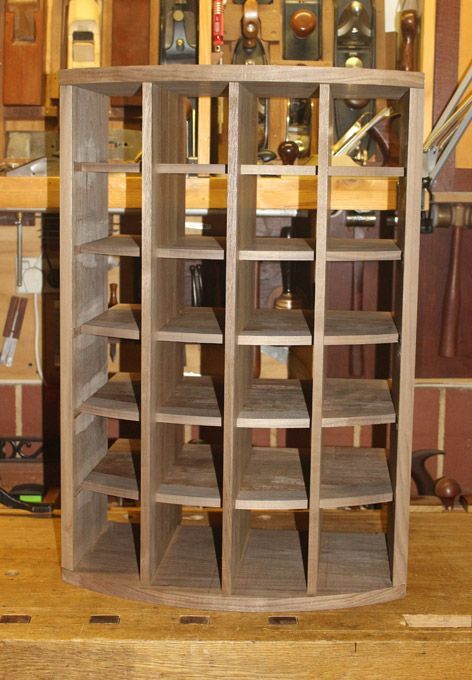 I'm particularly interested because I did a similar lyptus cabinet without the curved front for my wife a few years ago, when I used a lot fewer hand tools than I do now. 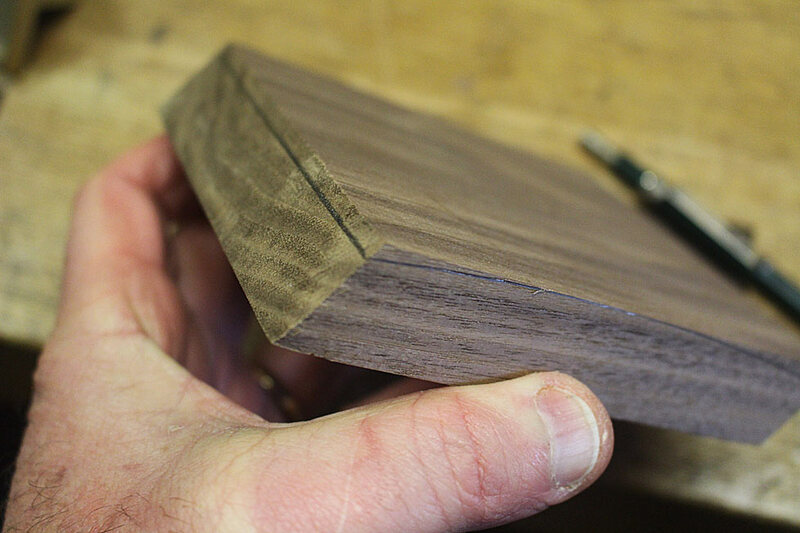 * How did you trim the edges of the walnut flush with the Merbau on the drawer - router with the templates that you made? 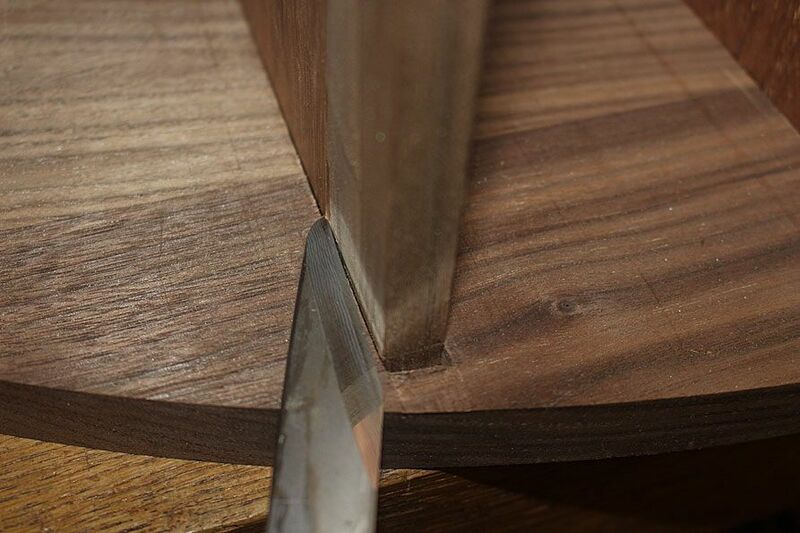 * Interesting pic of the bevel up smoothing plane flushing the walnut. 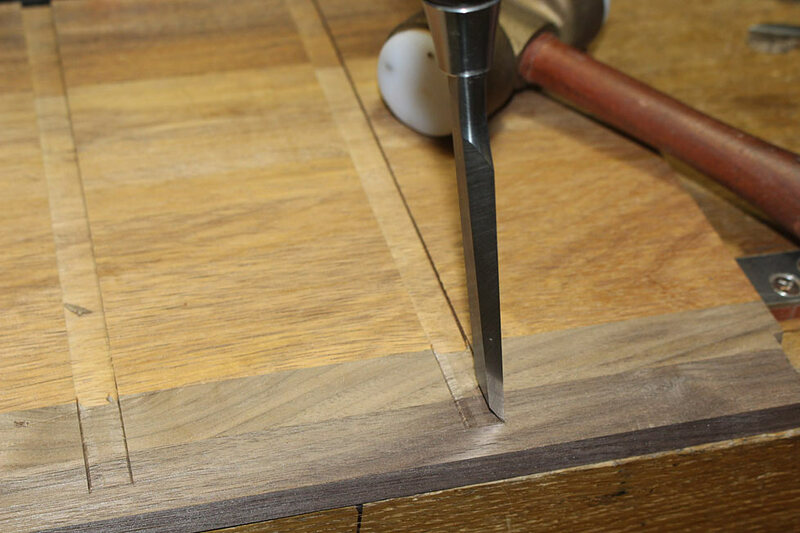 Did you have any issues with different grain direction or wood hardness when planing on the joint between the walnut and merbau? 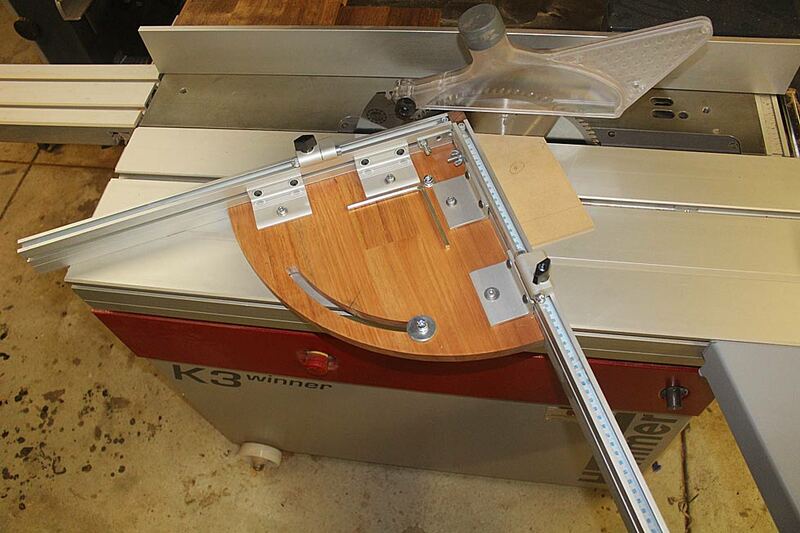 How steep was the planing angle? 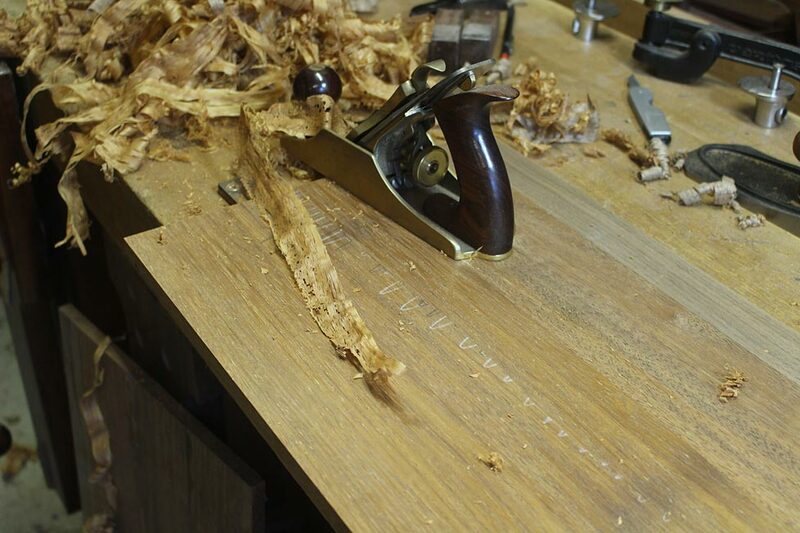 Harvey, I trim with hand planes. 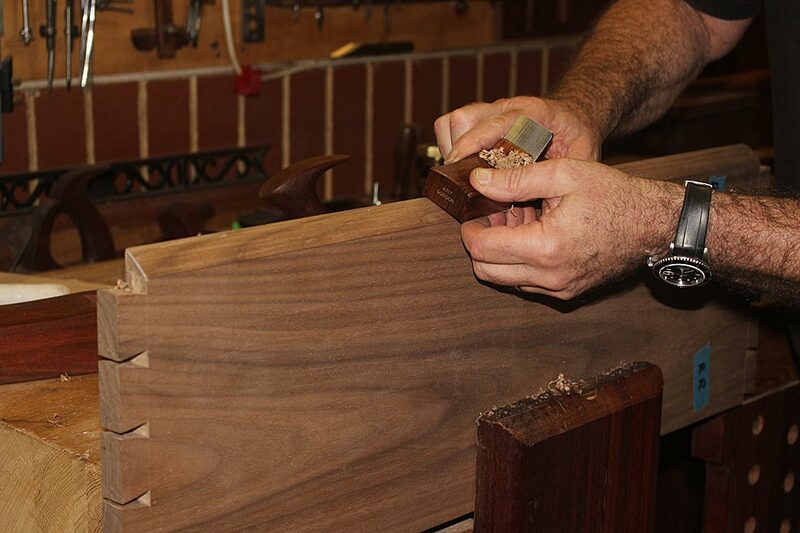 The walnut and merbau were glued with grain orientated in the same direction. This was deliberate to ensure planing would be easier. 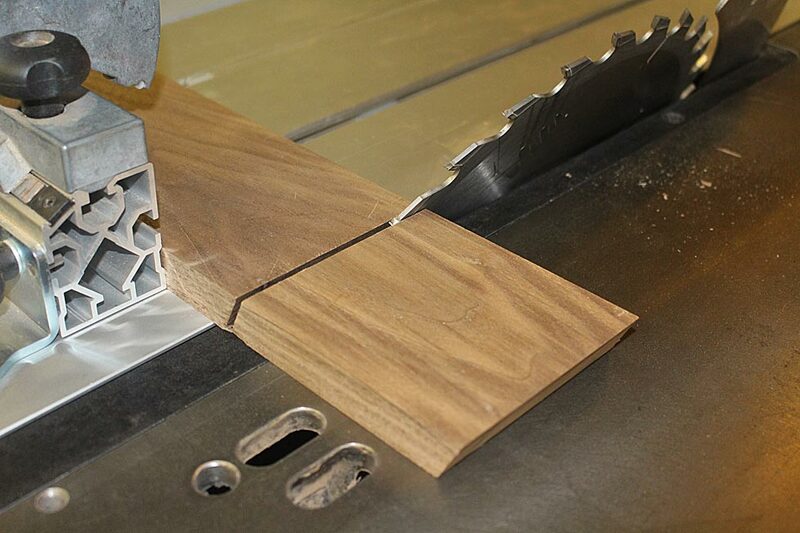 The BU Smoother always has a 62 degree cutting angle. 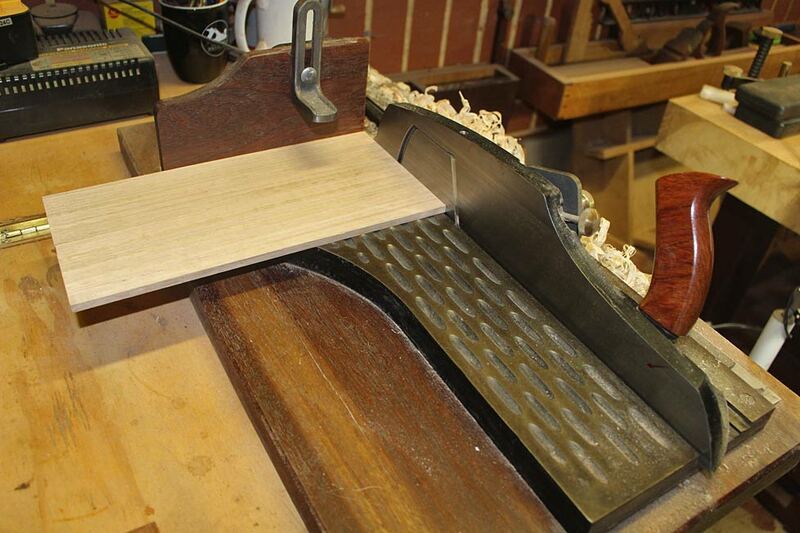 I only use this plane to take fine shavings. 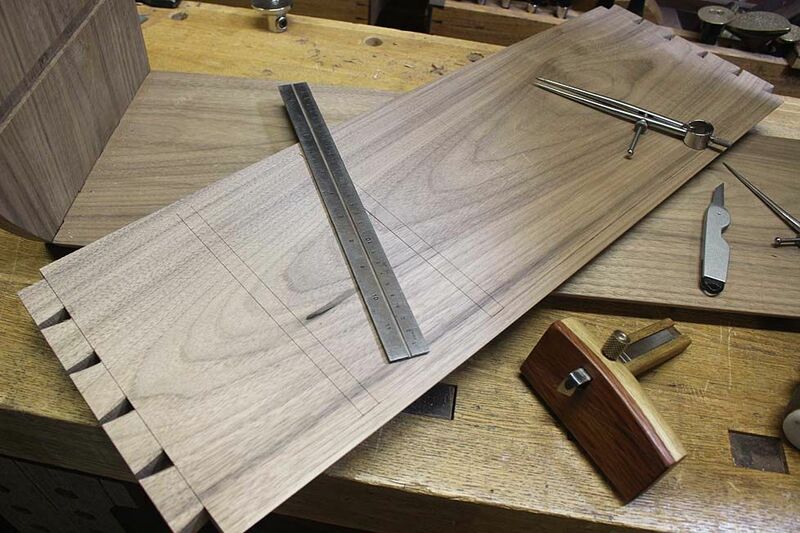 Well the carcase was finally glued up, everything square as can be ... and I forgot to take a photo of this! 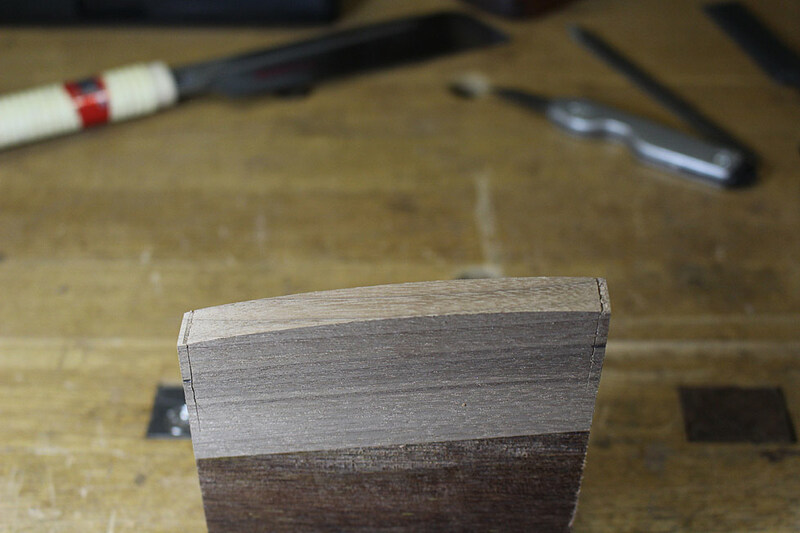 However, while planing the outside, I discovered that the black walnut required nothing more advanced than a simple single-blade common angle plane. 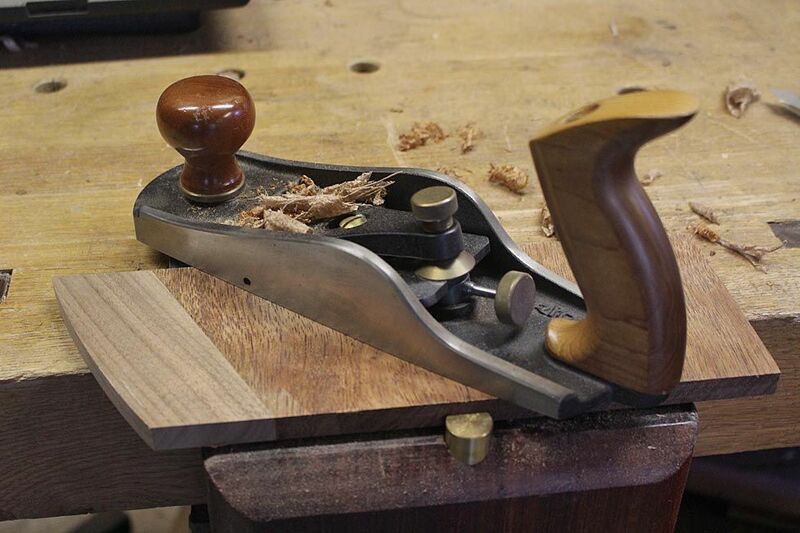 Many years ago I received a smoother from Steve Knight. This was the first occasion I got to use it. 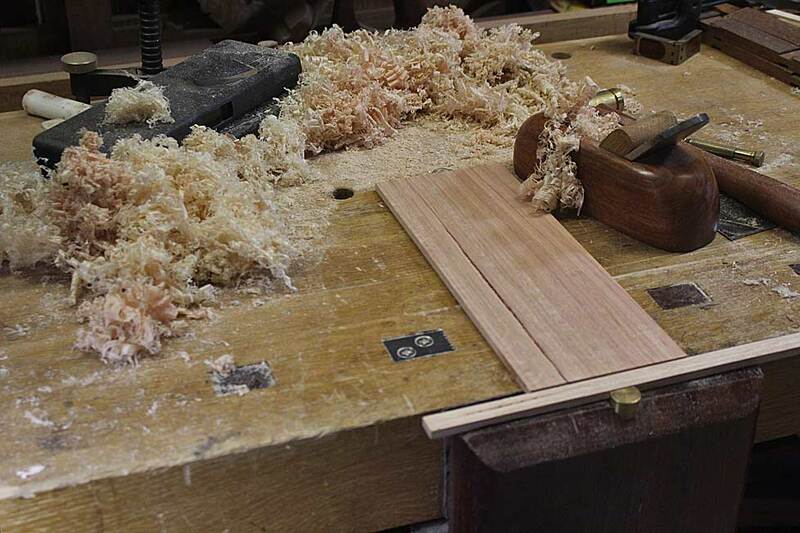 Just wonderful to work this wood! 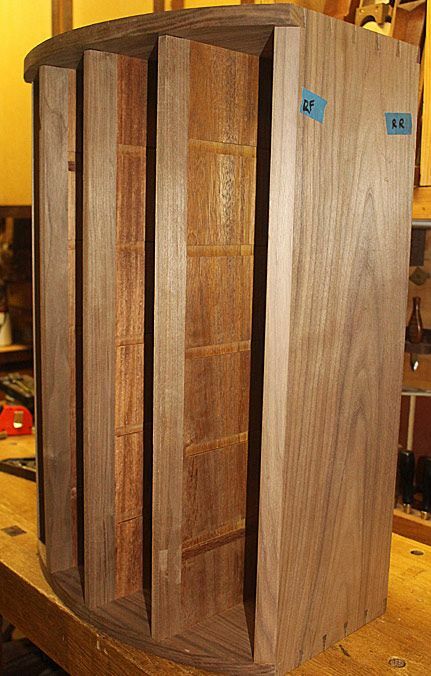 The next step was to complete the vertical dividers. 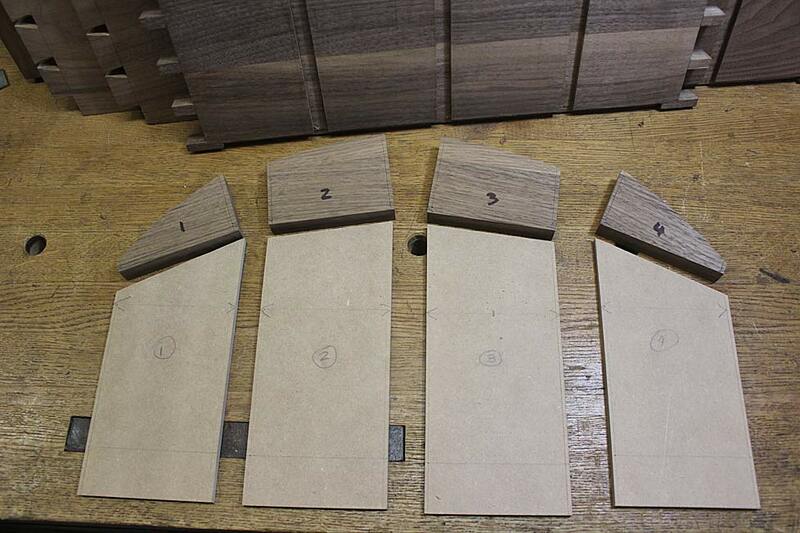 These were inserted and, with some relief, these were square as well. A reward for attention to detail? 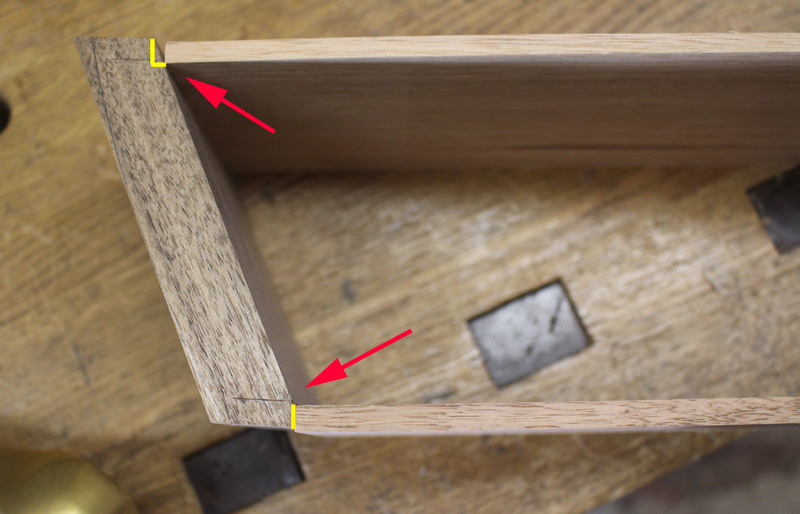 The photo below shows the next steps: the stopped dados need to be extended, and the faces of the dividers need to be shaped to match the angles of the carcase. 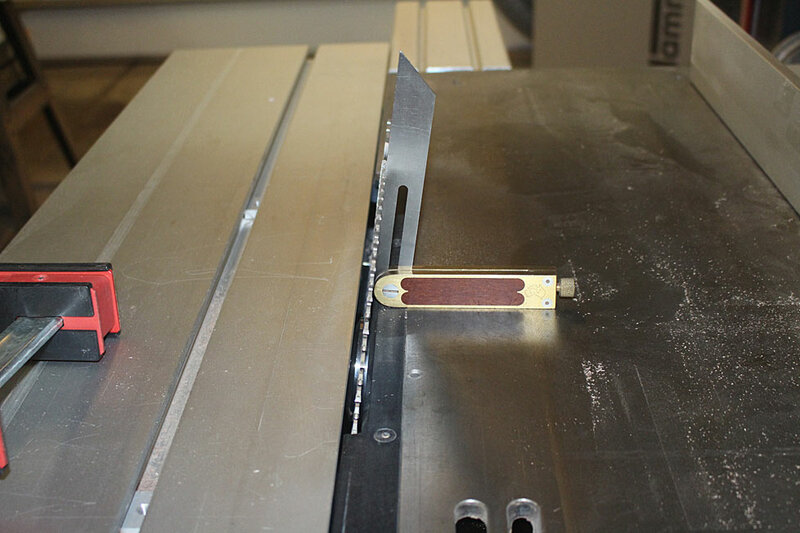 Below the rebates are marked and knife walls cut .. 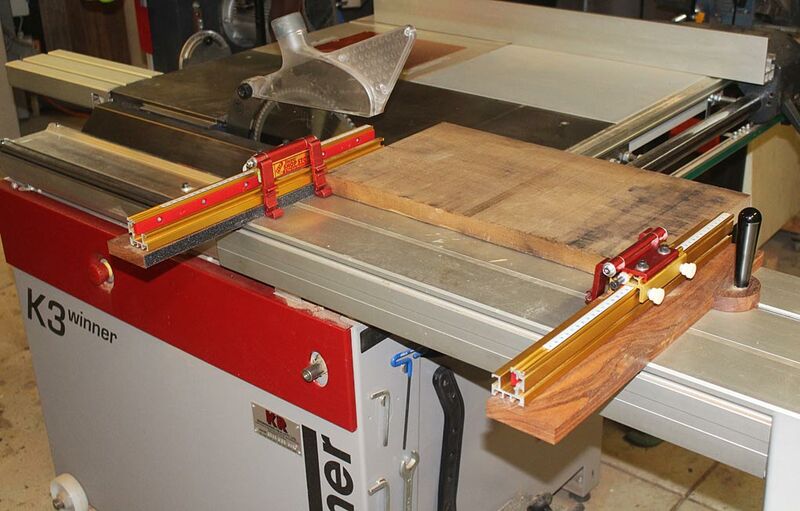 This will maximise obtaining a straight saw cut. 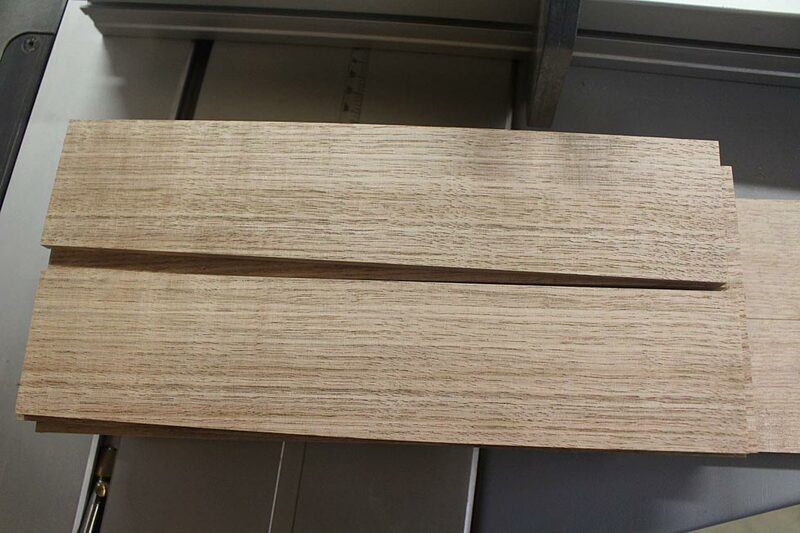 The drawer blades will remain loose until the drawers are completed, since they still need to be used as a template for each drawer. So that is it for this past weekend. 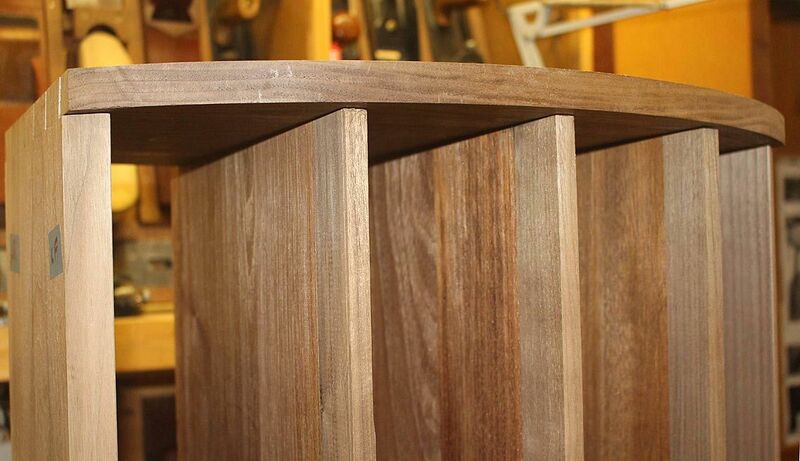 The drawers are next. 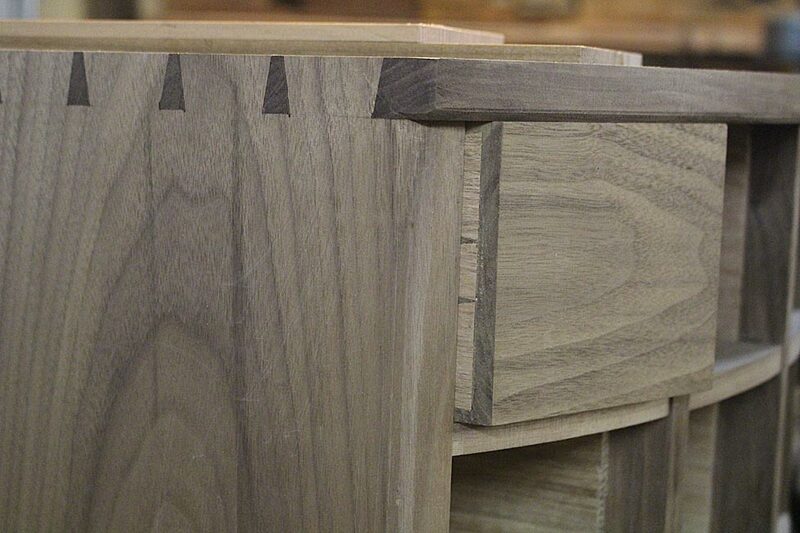 Curved fronts and compound dovetails. How much fun is that! 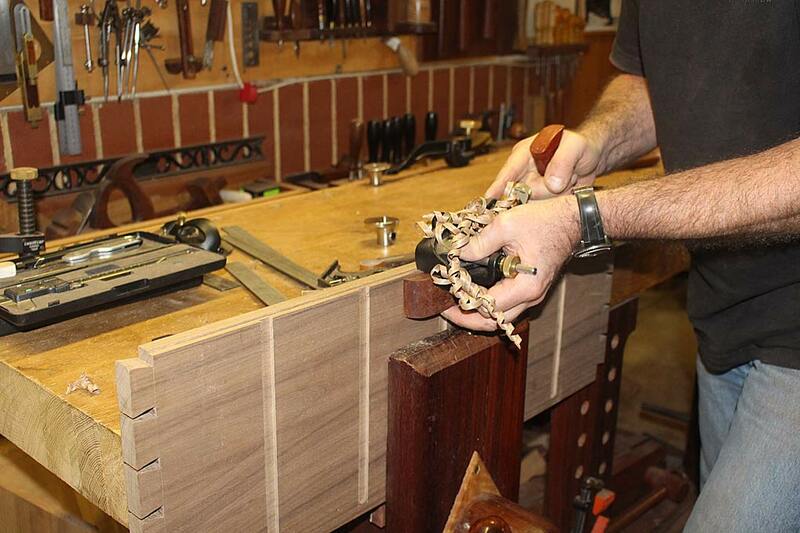 This weekend I spent time preparing to build the drawers for the apothecary chest. 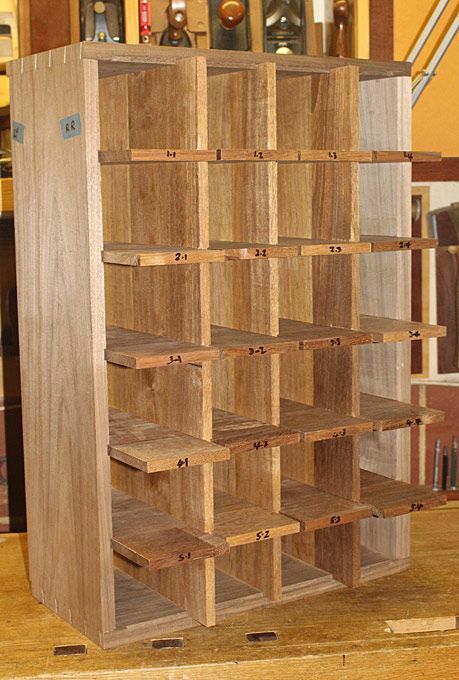 There are 24 drawers, which makes 48 drawer sides, plus 24 drawer fronts and 24 drawer backs. 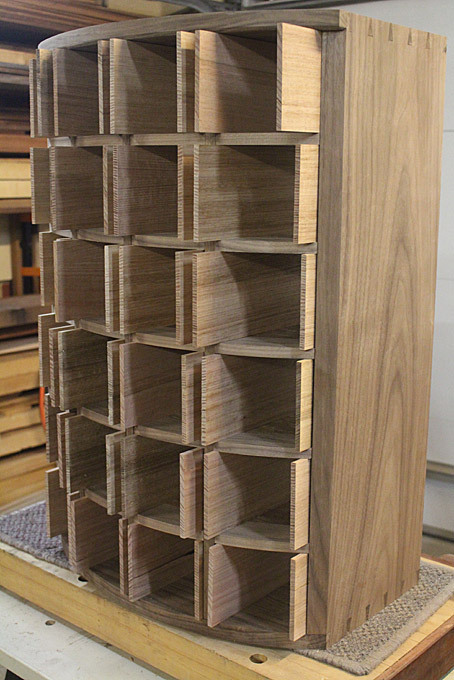 And then there are 24 drawer bottoms. 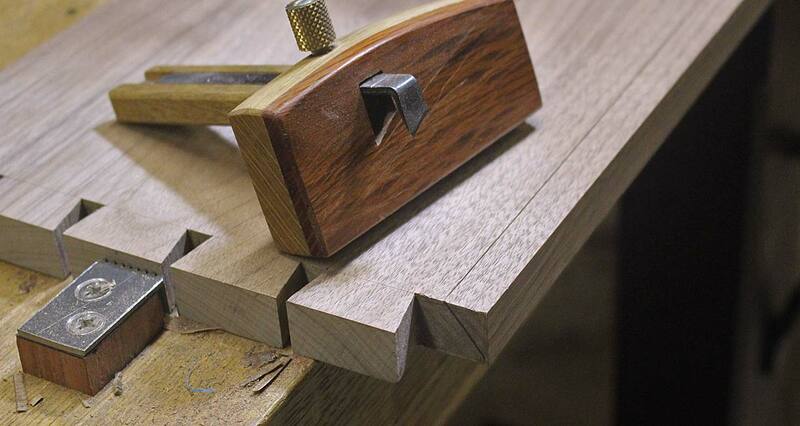 And slips for the drawers. 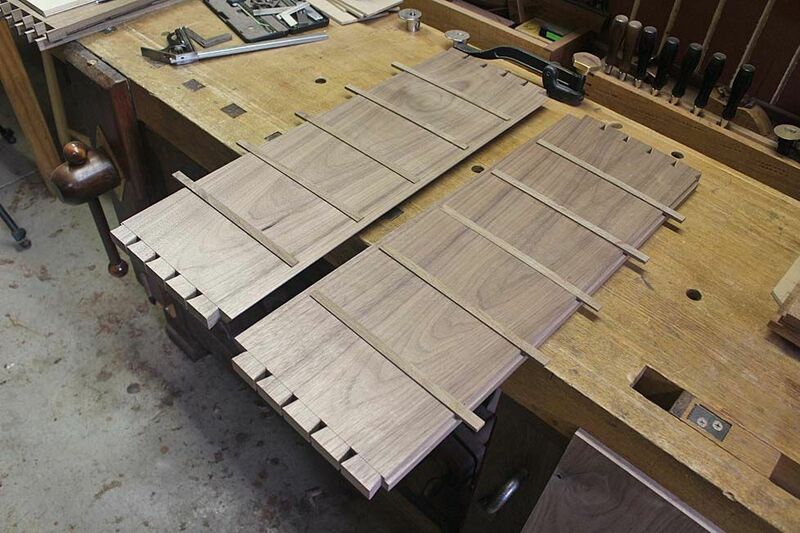 All this before building the drawers can begin. 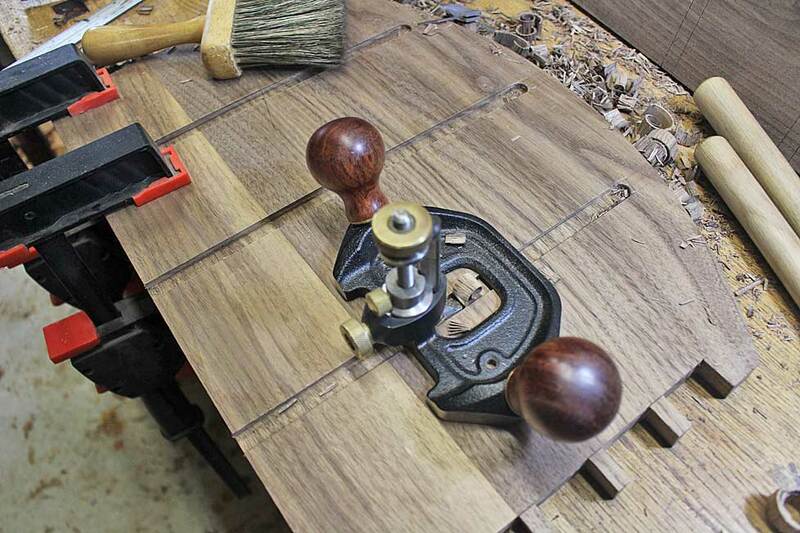 I wonder how long this would take if I did it all with hand tools? 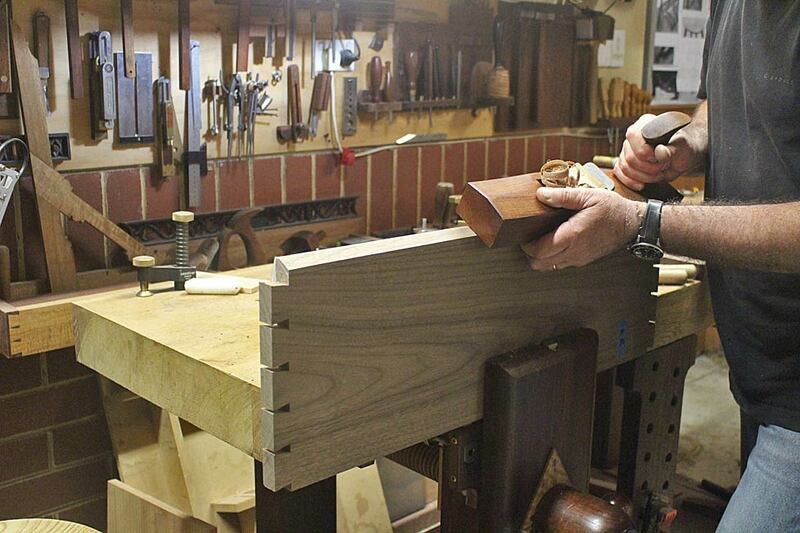 "The hand too maker needs the best bench he can make – or afford! 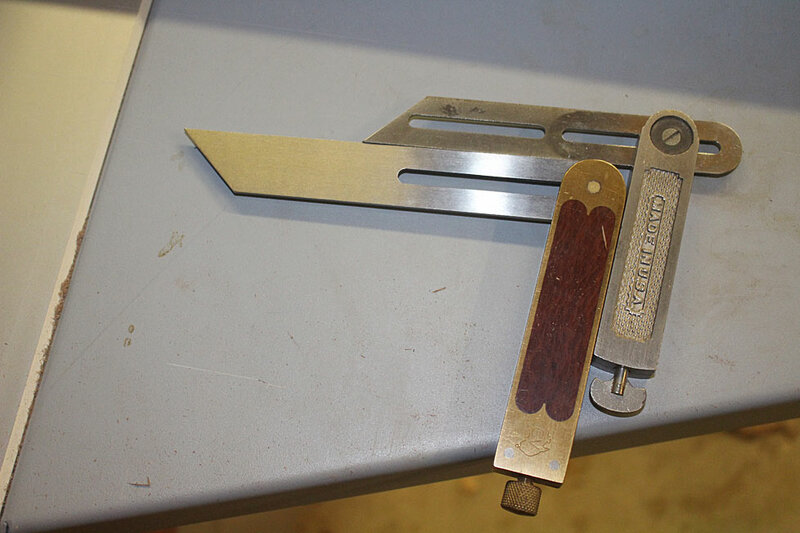 You must know your tools, what they are made of, fine adjustments and sharpening angles. 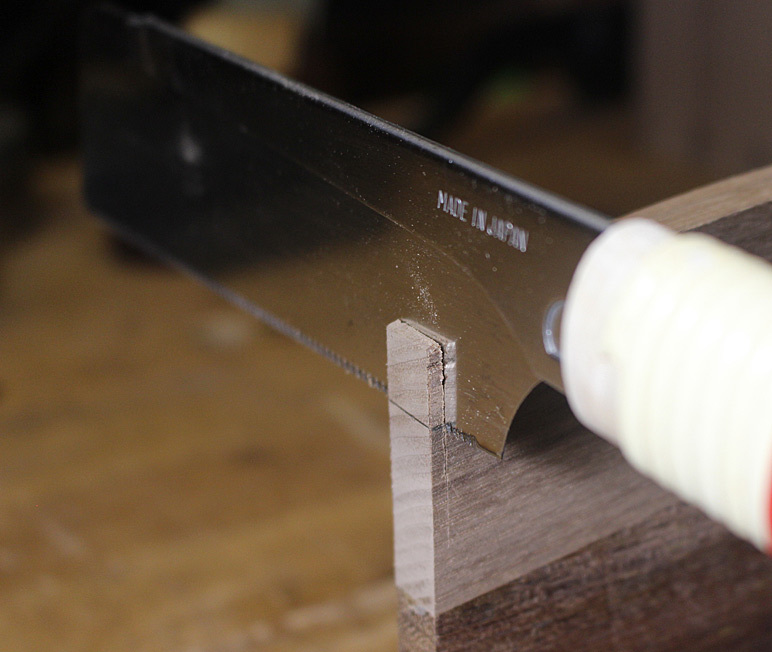 Everything must be clean and sharp. 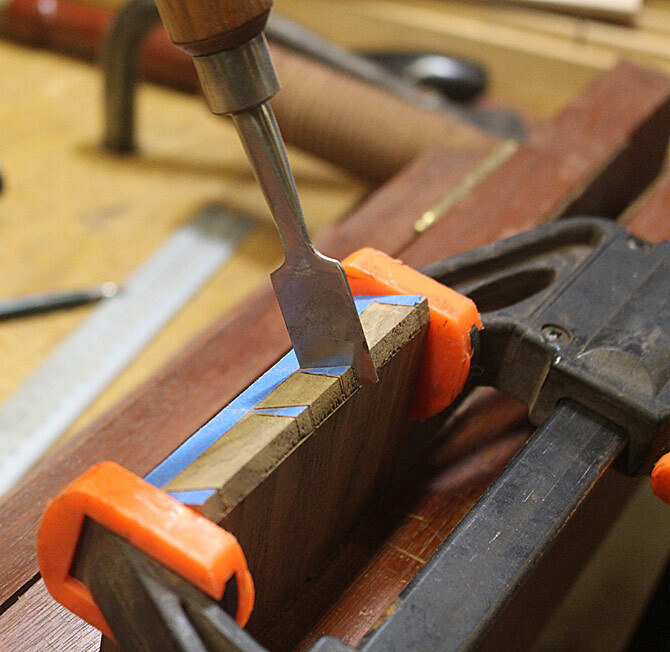 Tools talk to the craftsman, and will let you know when they are right. What the machine does by noisy, brute force, you will be able to do with quiet cunning"
"I would not go so far as to say that there are no skills necessary to working machines. It is important to be able to read and interpret complicated instructions. 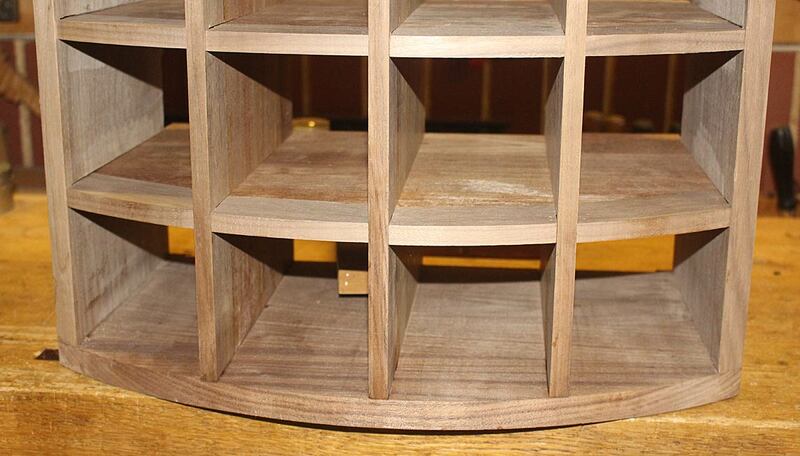 What you end up with is engineering skills – precision engineering in wood". What has this to do with the work I did this weekend? Well, I could relate to the role of engineer. 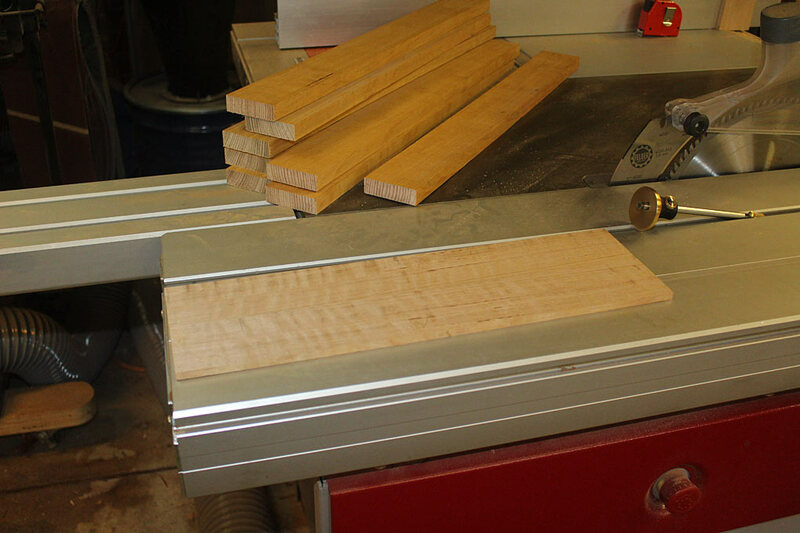 Preparing the wood for the drawers with my machines was the work of a machinist. 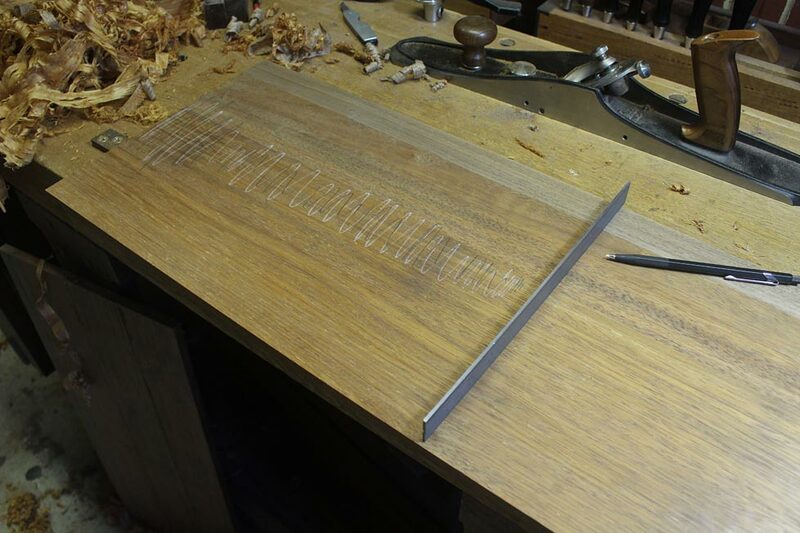 Would I have rather spent the time doing this by hand? 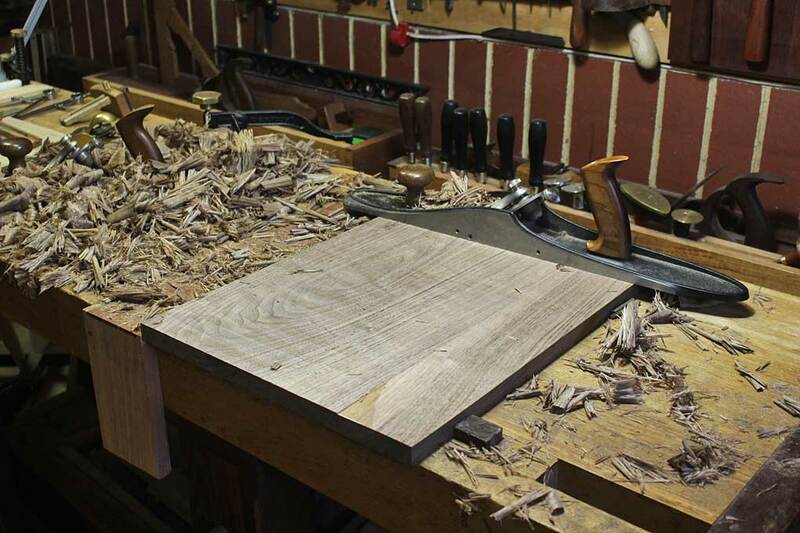 Well, I have done this in the past - I worked almost exclusively with handtools and a few hand power tools for over 25 years before purchasing a tablesaw, jointer, thicknesser/planer, and bandsaw. I began upgrading these over the past 7 years. I would not go back. 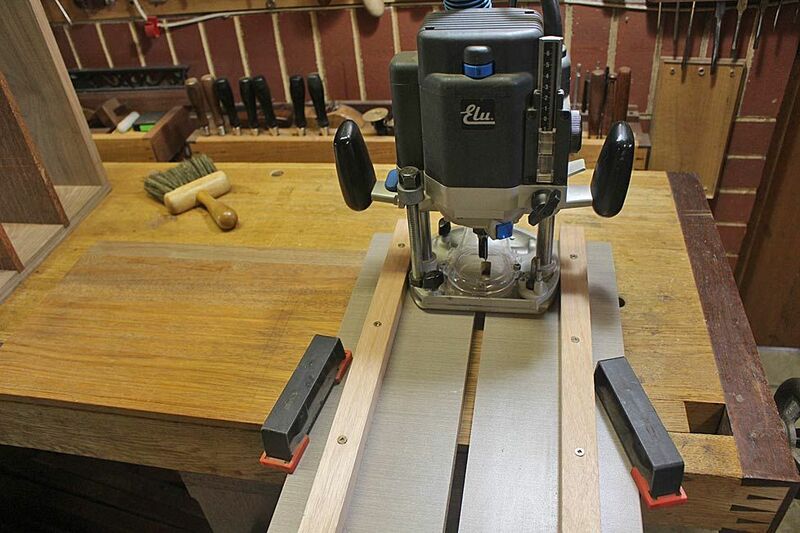 Machines do not replace handwork. The question is whether this compromises the work I do? 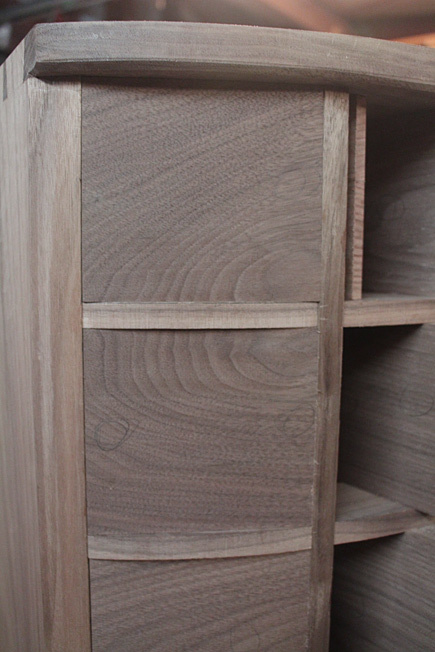 The drawers have Tasmanian Oak sides and back. 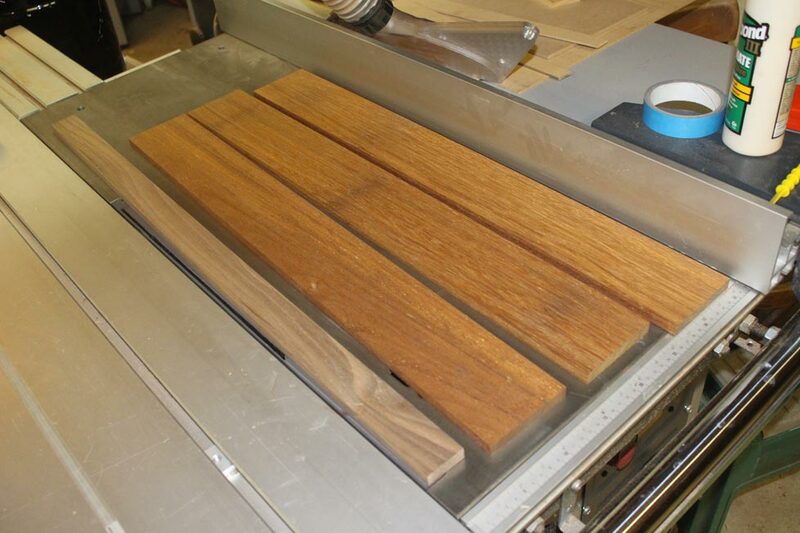 The drawer front will be Black Walnut to match the carcase. The oak has become harder to come by in Perth. 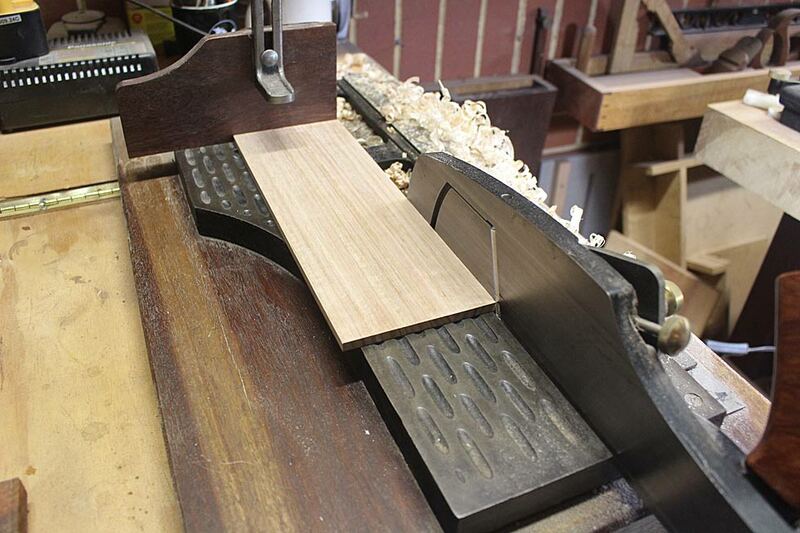 I prize it because it is all quarter sawn, which is ideal for drawer sides as it is stable. 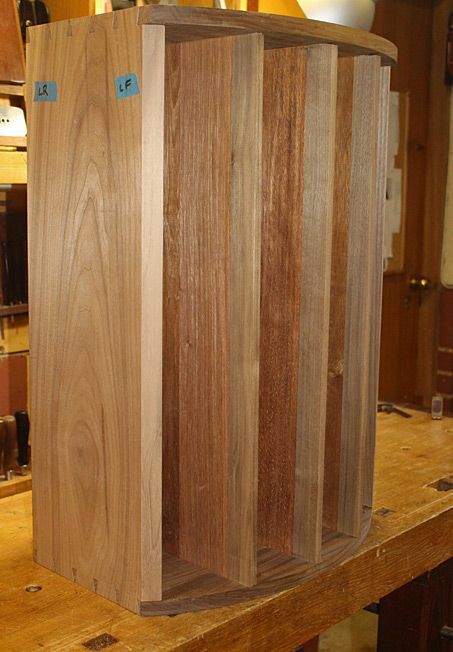 It is light in colour and a good contrast to dark timbers. But I have so little now. 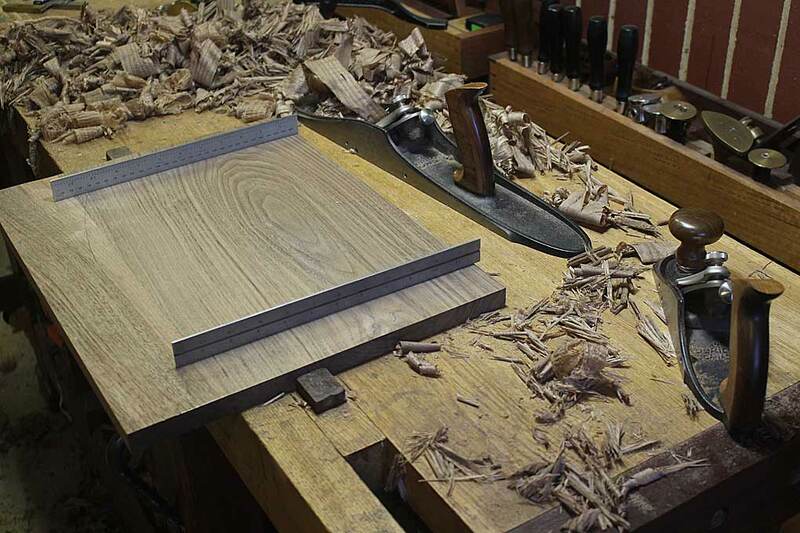 Much of it is narrow boards - I grabbed everything that my local Bunnings store had a few years ago when I heard they were no longer going to sell it. This was at the end of Saturday. 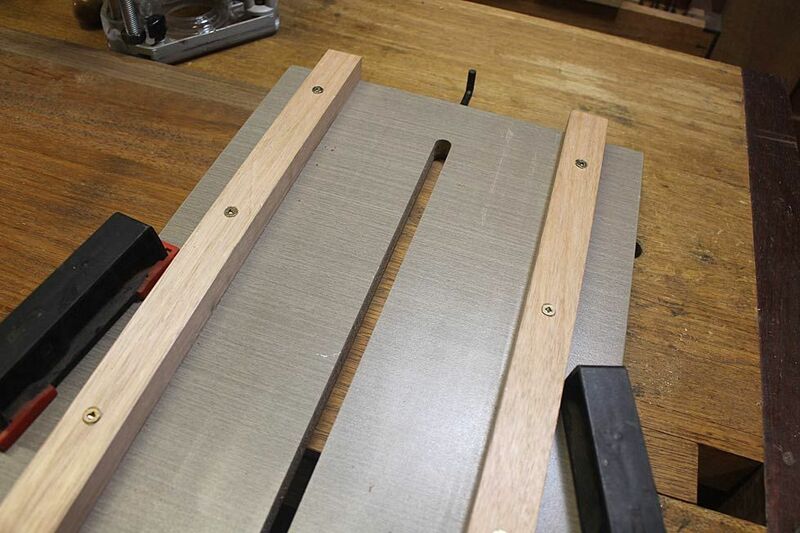 Drawer sides taken to 1/4" and stickered. I have had good fortune with this method in the past. 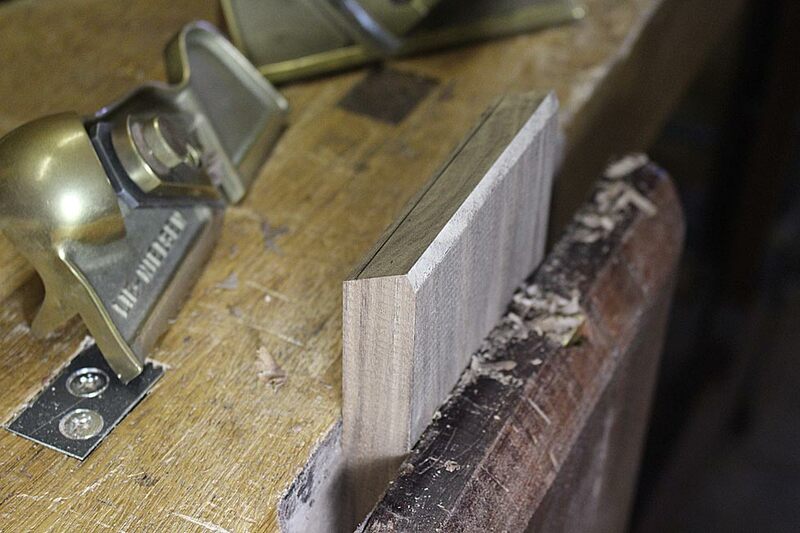 The wood is stable and cleaned up with a cabinet scraper. 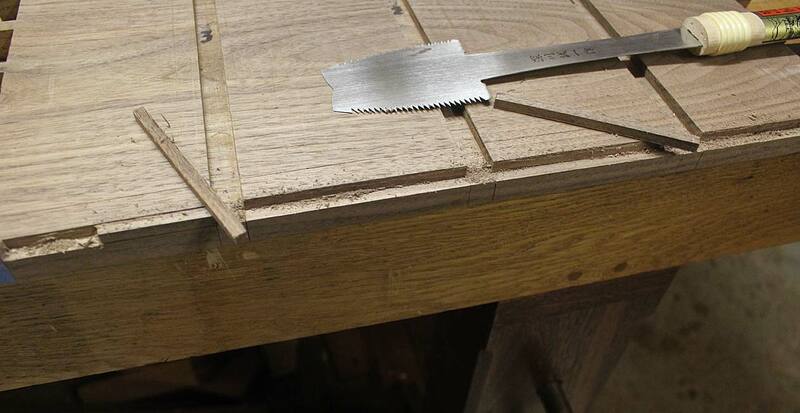 If there is any slight movement, it will be taken out when dovetailed. 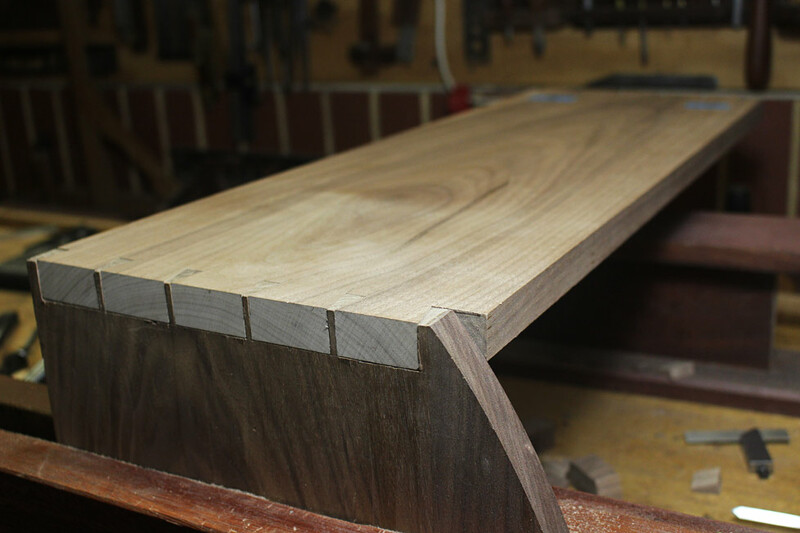 The black walnut is rough sawn. 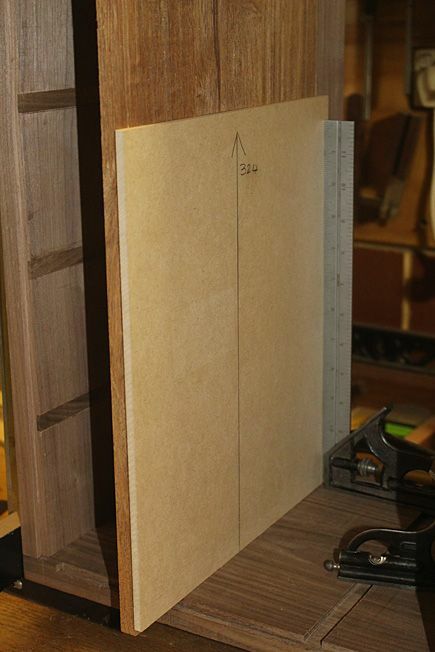 This board is 1" thick and will make all the drawer fronts. This is just raw material. 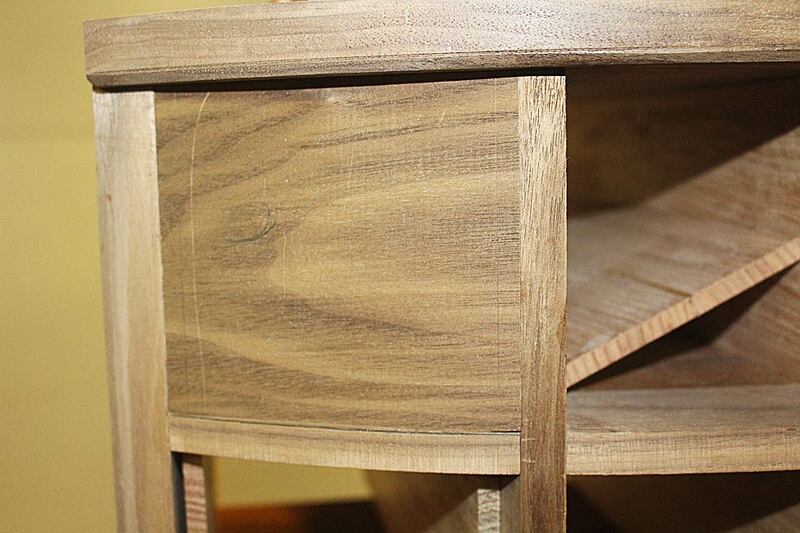 It does not replace the handwork in building the drawers. 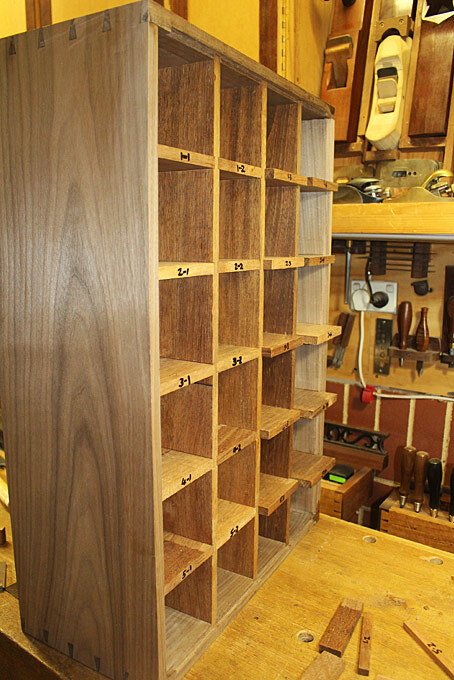 There is so much more still to do ... and I have not even made the drawer bottoms or slips. I continue to enjoy this post. 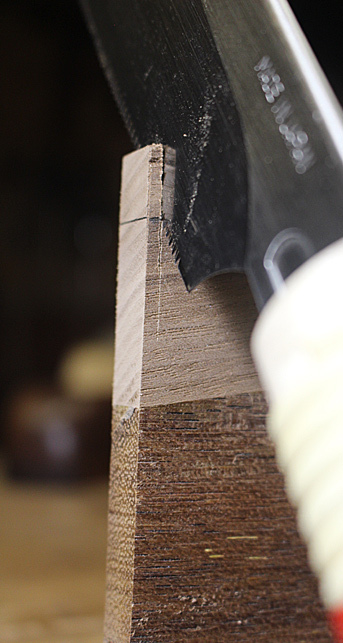 I agree with you on power vs hand tools, but I would add that you learn things about reading wood when using hand tools that you can't learn any other way. 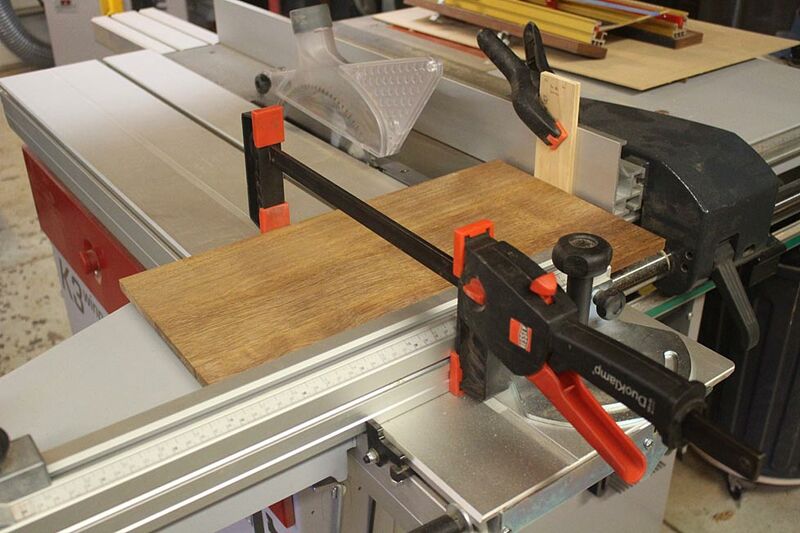 The same is true of power tools, but perhaps I take what I've learned using power tools too much for granted . 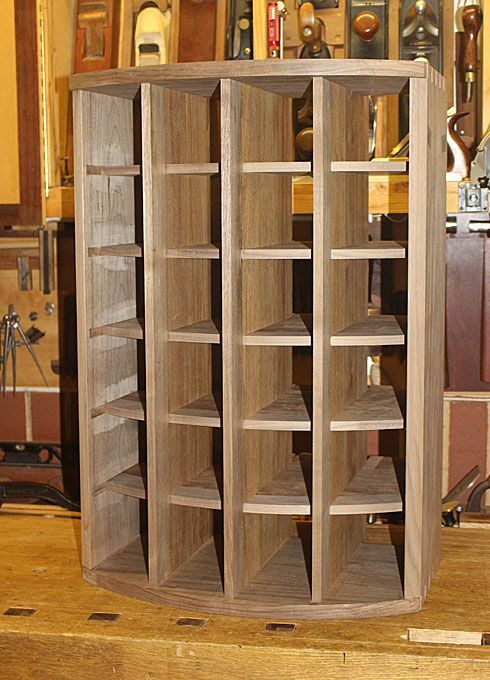 Derek, thank you for sharing this build! 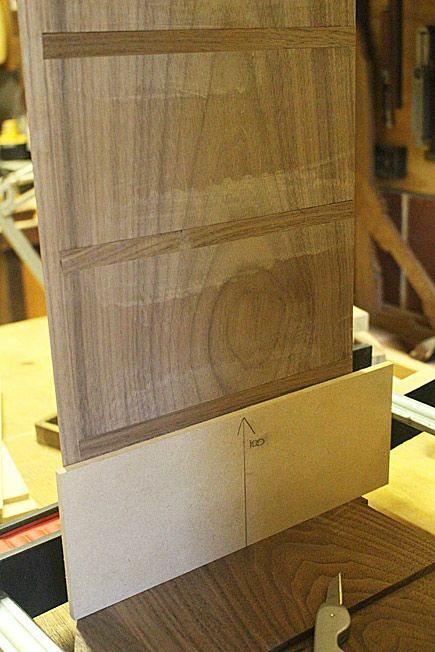 I love the insights into your build process and techniques! I’ve been following along from the first post. 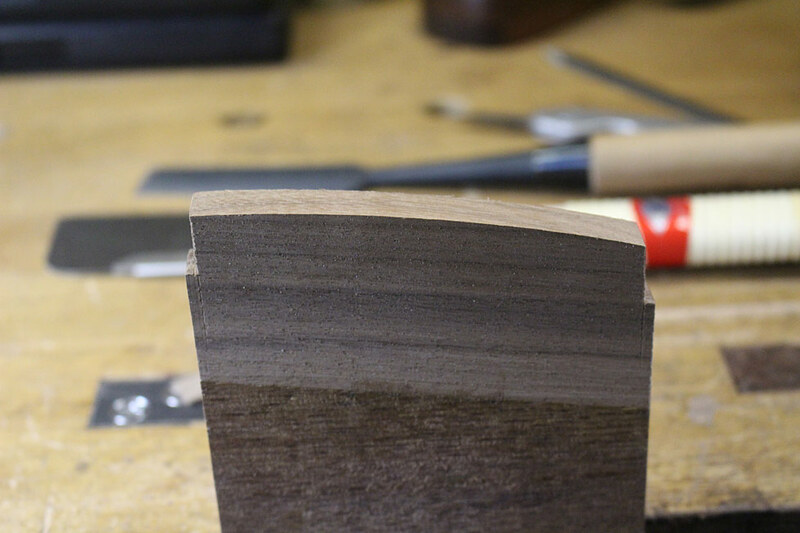 I hope to get more comfortable with hand tools, but as it stands, entrenched in the power tool world, so your posts further inspire me to just try. My fear is the end product looks like a 6th grader did it (Im sure there is a 6th grader or two out there that is better with hand tools than I am). Yes..thank you for taking the time sharing the build, your recovery with details missed....and your narrated thoughts...very enjoyable. Very nice stuff...thanks for taking the time to go through it a step at a time. 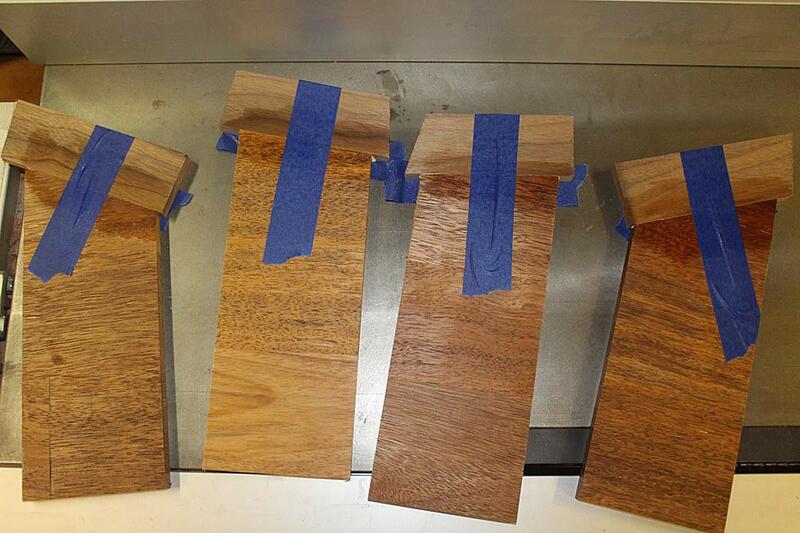 Thanks also for the clear, in-focus photos to highlight the process. 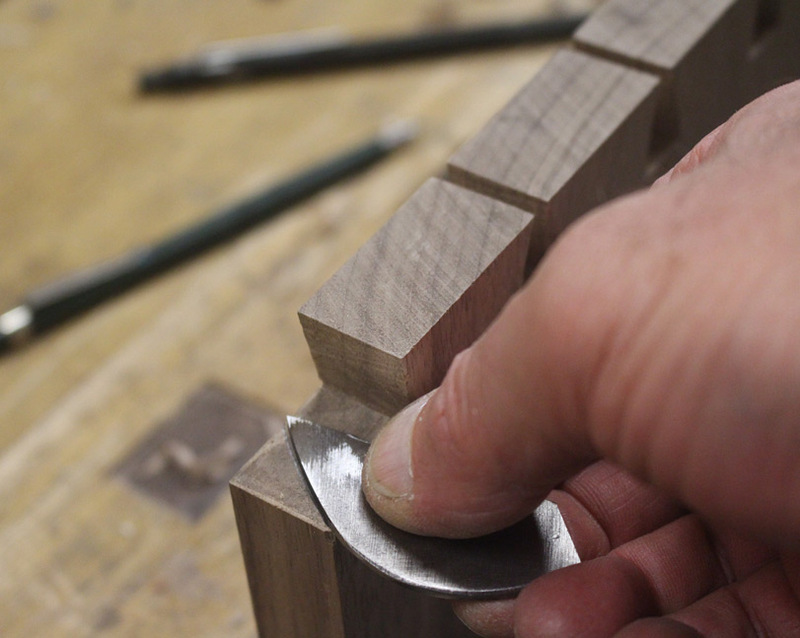 While I'll never use hand tools as the primary mainstay of my projects, it's the basic creation/build/assembly process that remains the same whether using hand tools or power tools that needs to be followed. 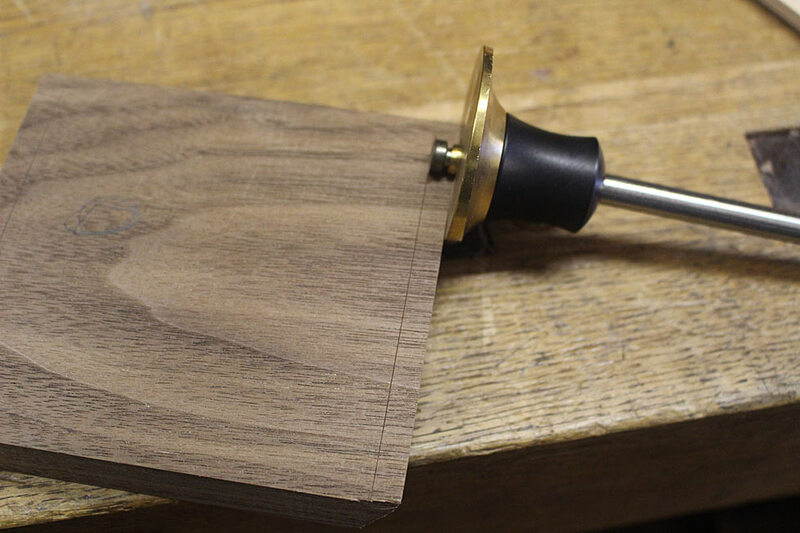 Cheese, I would never suggest that one use power- or hand tools as the "primary" set of tools. 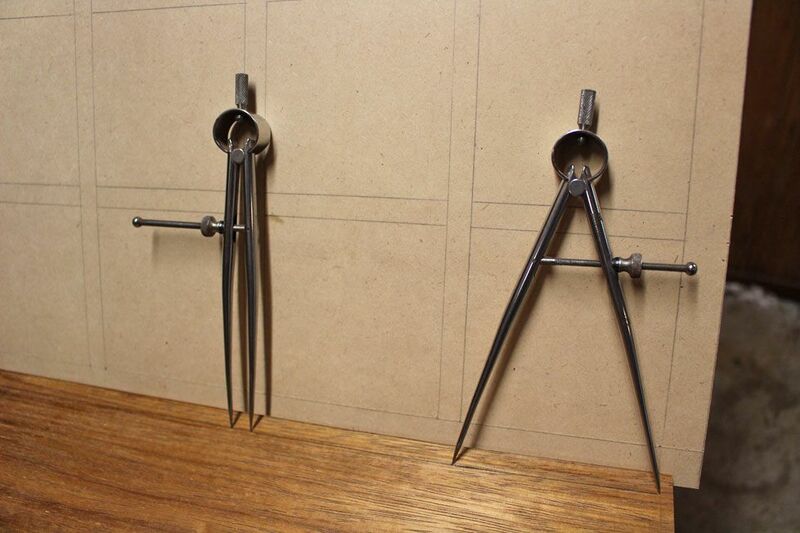 Mainly because I do not believe that their should be a primary set of tools. I believe that one uses the best tool for the occasion. 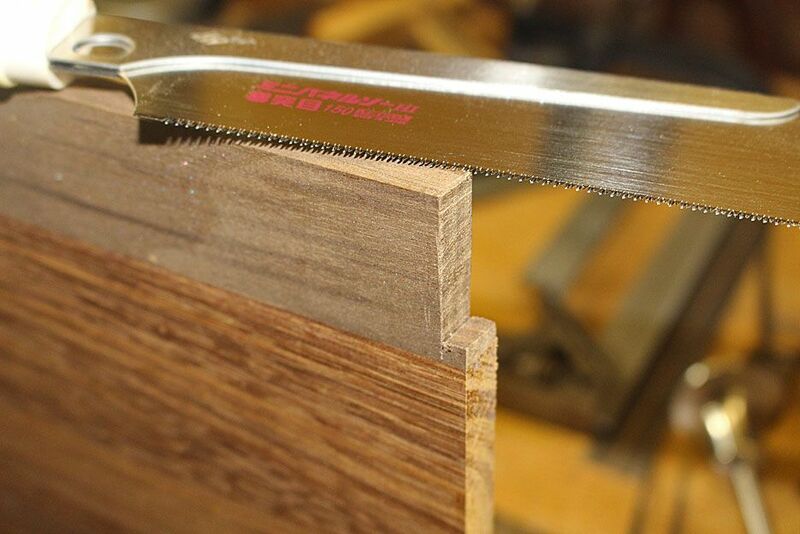 This could be power to rough out and hand for delicate joinery. 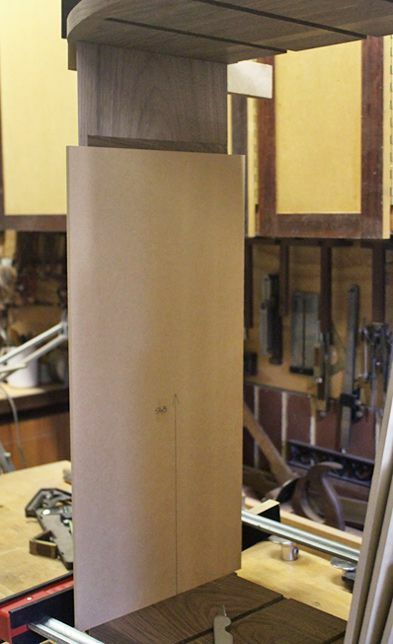 Part eight - I think that this is the 7th weekend of the build. 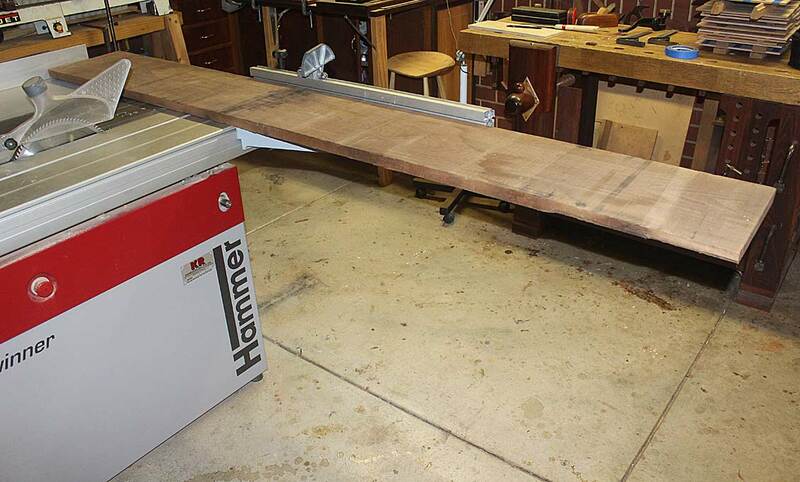 The plan is to start building the drawers, or at least have a plan for the drawers. There is not as much time available this weekend as I would have liked. A bit more practicing, and I will be ready for the real thing. Any thoughts how else this could be done? 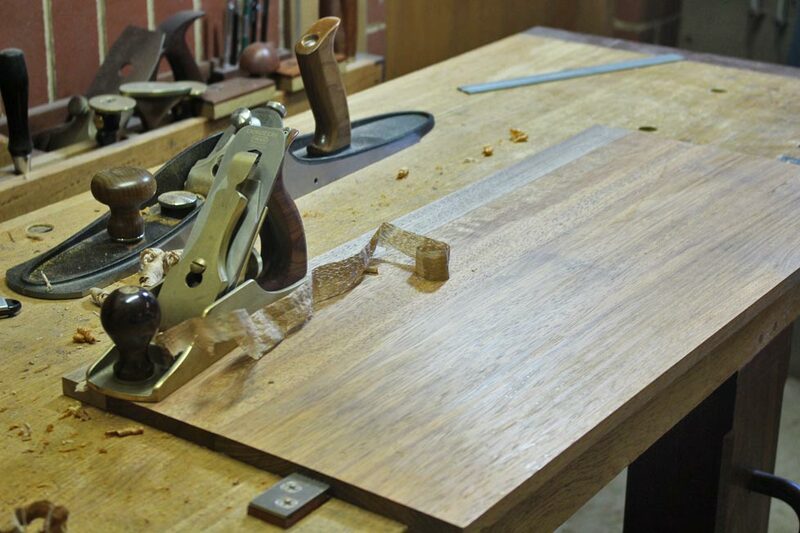 Today was a public holiday in Western Australia (WA Day), and so I managed a few hours in the workshop this afternoon ("arvo", which is afternoon in Australian). The morning was filled with writing bloody reports. Aren't I the lucky one! It was great to escape back to the build. All this geometry is making my head hurt. Amazing piece of work.